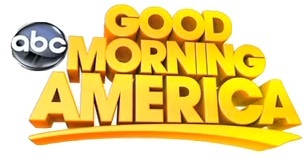 Anthony Rubio was interviewed for Good Morning America on the ABC network. 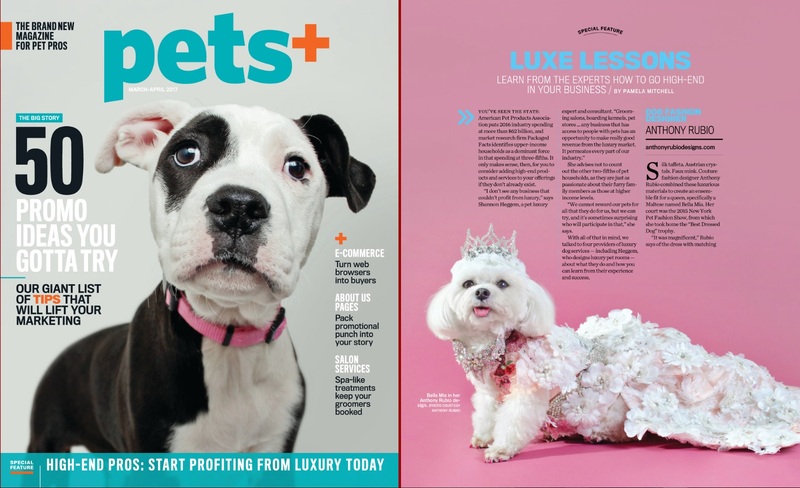 They discussed Mr. Rubio being the Top Pet Couturier, his designs, his recent Fashion Show at Brooklyn Fashion Week and the book Couture Dogs Of New York. Anthony Rubio on PEOPLE TV! Watch Anthony’s in-depth interview and a look at what his runway shows are all about in their new video series Paws and Claws. 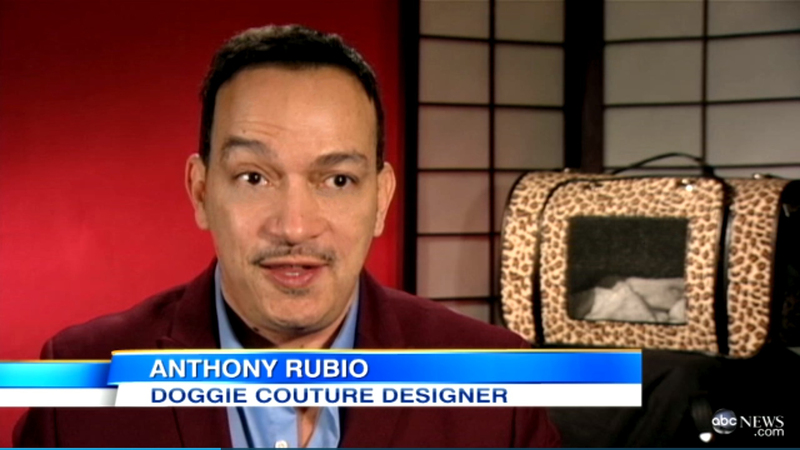 Anthony Rubio’s Canine Couture and recent New York Fashion Week runway show were featured in a segment on Inside Edition in its 30th season. Anthony Rubio in Harper’s Bazaar! They have a new video series called WTFashion with William Graper. 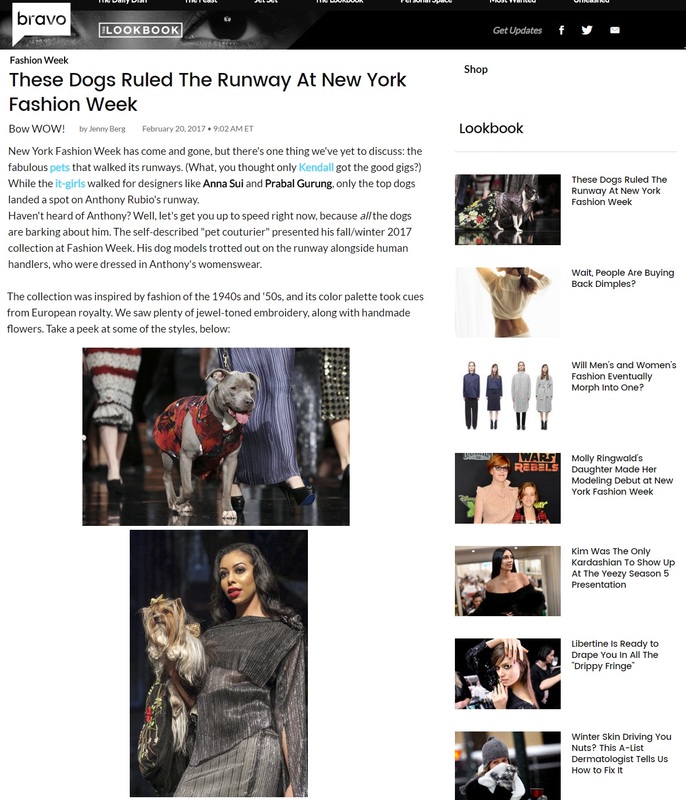 The episode covers Anthony Rubio’s Canine Couture and the Anthony Rubio Designs runway show during New York Fashion Week. 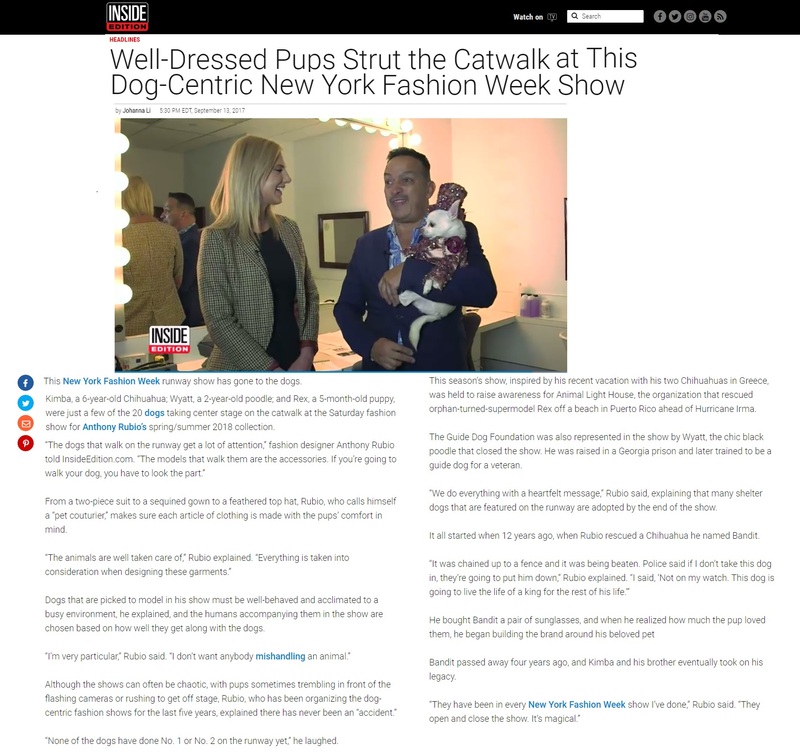 The nationally syndicated program Page Six TV airs nightly on the FOX network which is hosted by John Fugelsang along with co-hosts Bevy Smith, Elizabeth Wagmeister and Carlos Greer aired a segment on the Anthony Rubio Designs’ New York Fashion Week runway show along with his Canine Couture. 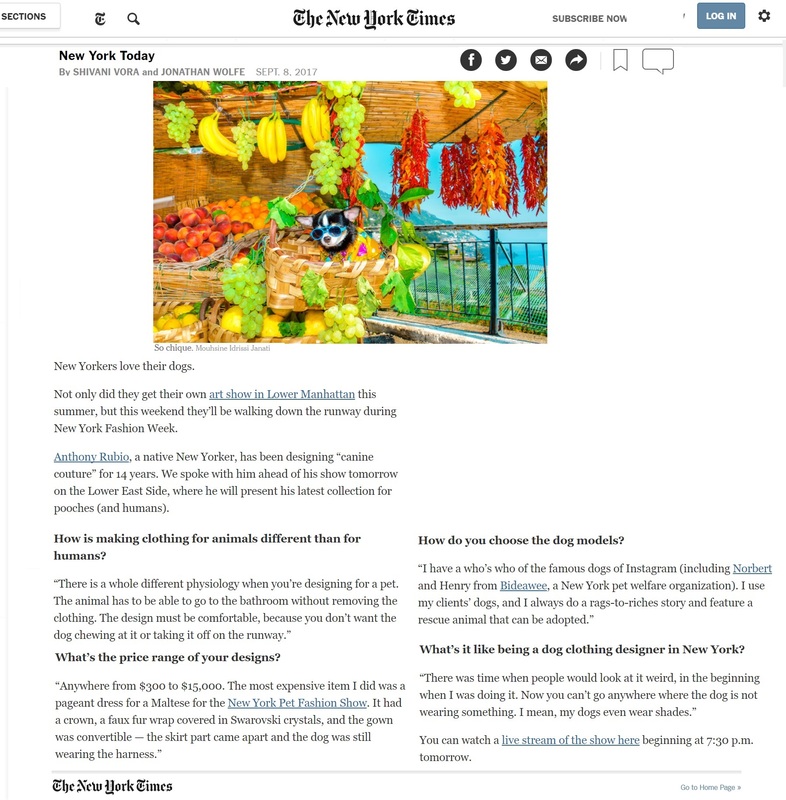 Anthony Rubio featured article in the New York Times. The interviewed covered his designs and upcoming Runway show during New York Fashion Week. Anthony Rubio recreated iconic creations by Rei Kawakubo for Comme des Garcons as a tribute for the 2017 Met Gala. 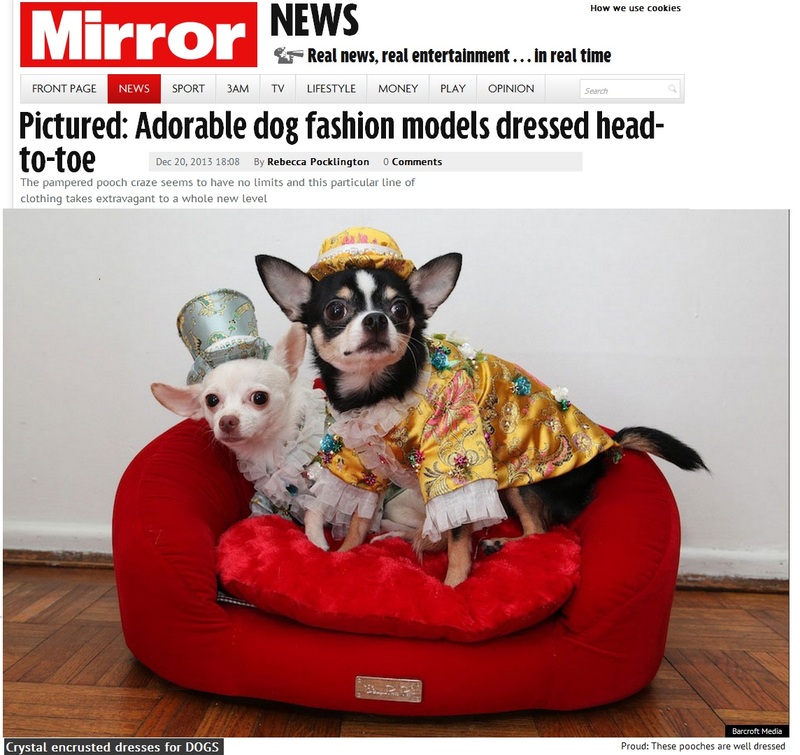 Chihuahuas Bogie and Kimba modeled the creations in Tour de Force representing Avant Garde fashion. Anthony Rubio In The Daily Mail! 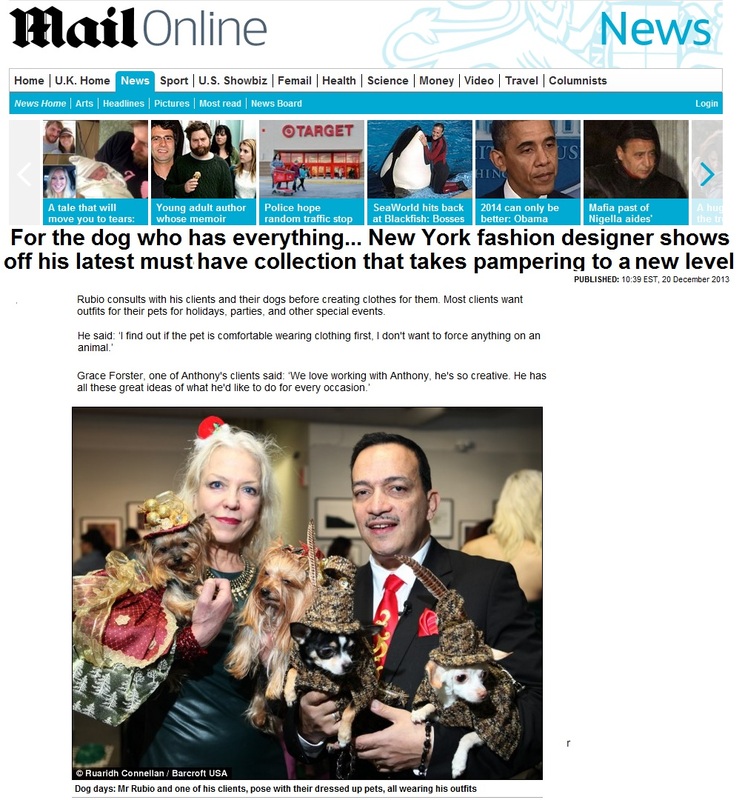 Anthony Rubio’s Fall/Winter 2018 Canine Couture & Women’s Wear runway show during New York Fashion Week featured in the Daily Mail. Anthony Rubio featured article in the Los Angeles Times. 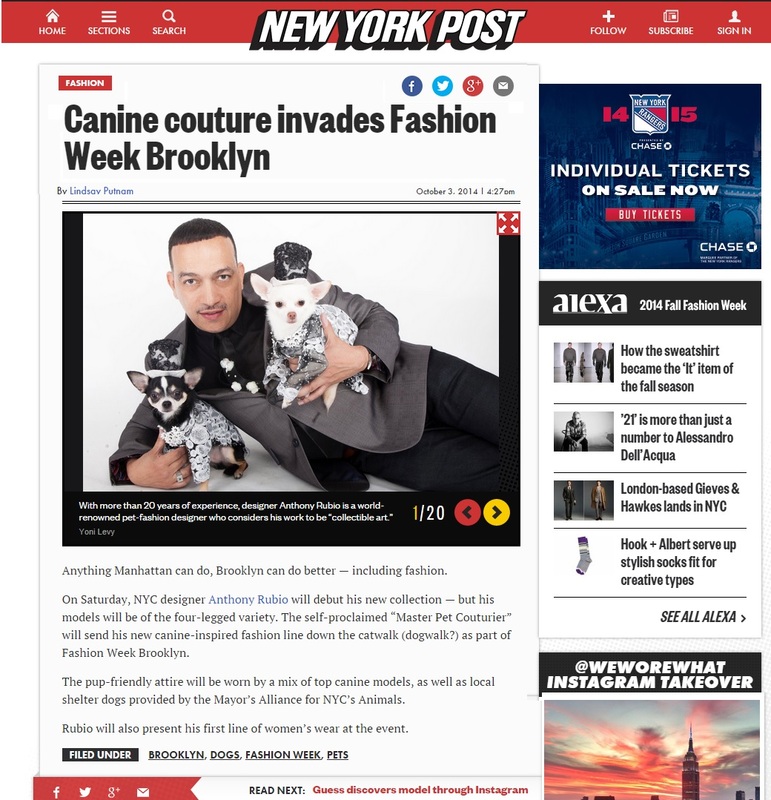 An article on his Canine Couture and being the first Pet Fashion designer to showcase during New York Fashion Week. 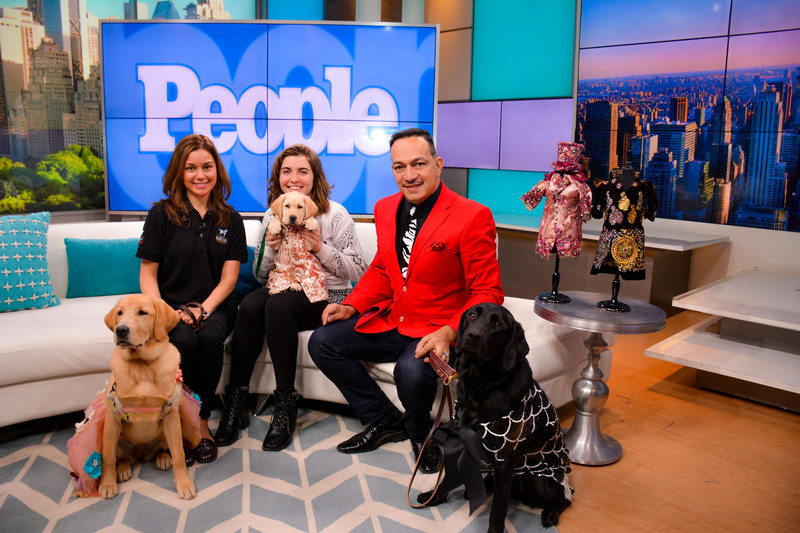 Anthony Rubio appeared on People Magazine’s PEOPLE Pets Live show. 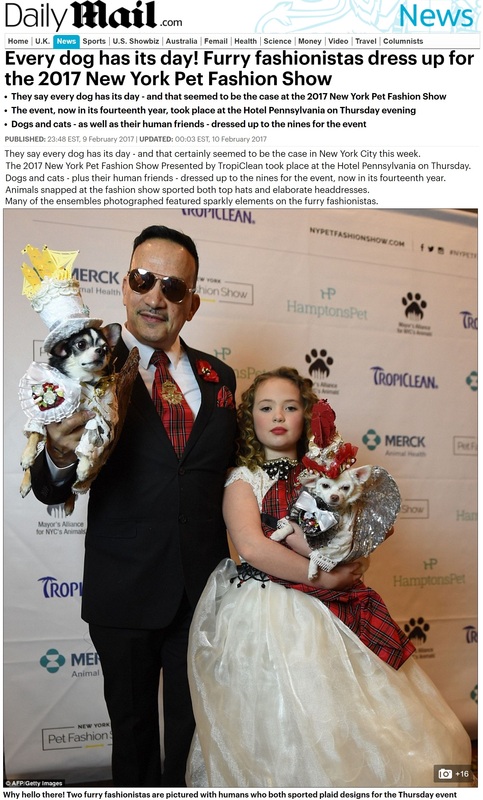 His appearance was to promote the event Dogs on The Catwalk, A Canine Couture Fashion Show, a benefit for the Guide Dog Foundation. 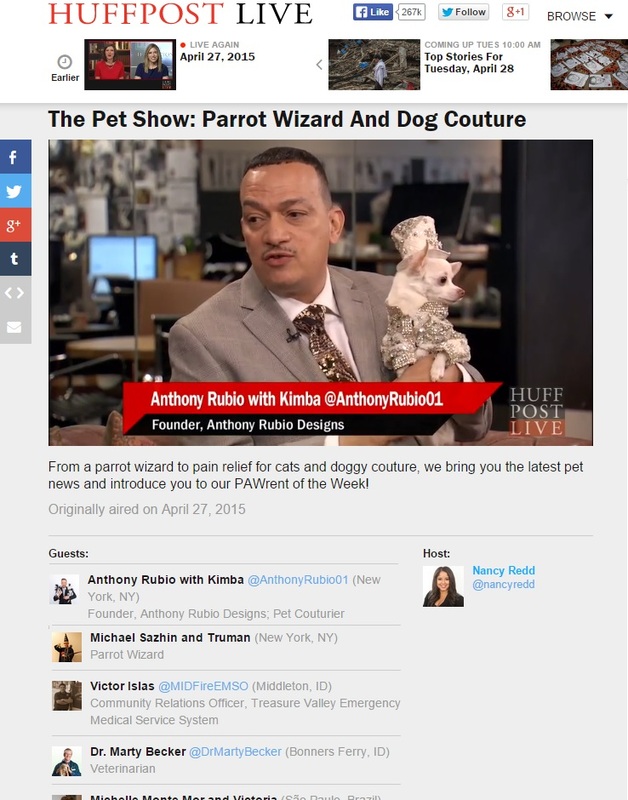 Dog Fashion with Pet Couturier Anthony Rubio on HuffPost Live. 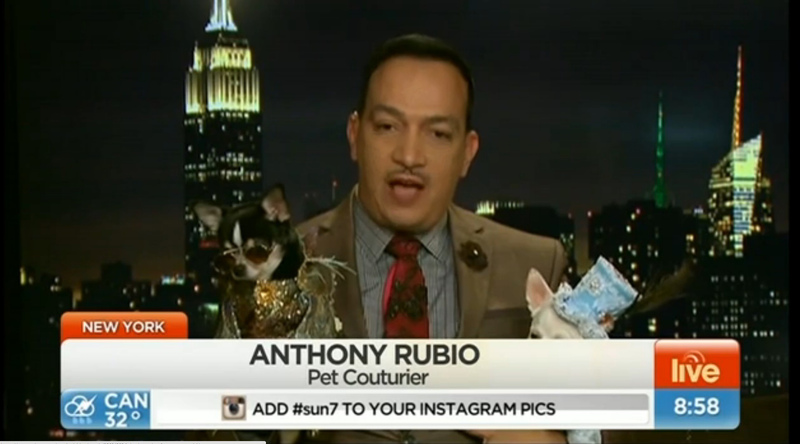 Pet Couturier Anthony Rubio appeared on The Pet Show with host Nancy Redd on Huffington Post Live on April 27th, 2015. They discussed Anthony’s award-winning creations and animal welfare. Watch the full interview at the 29 minute mark HERE. 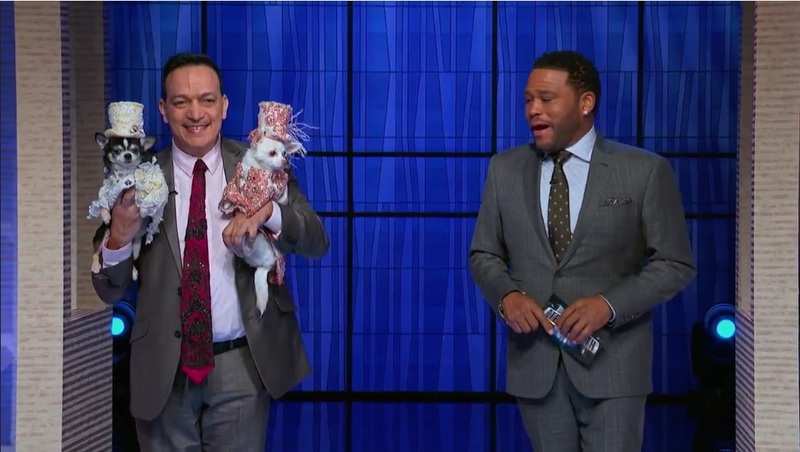 Anthony Rubio was a guest on the premier episode of the new daytime talk-show Ice & Coco on the FOX network on Monday August 3, 2015. He presented his most iconic creations modeled by canine models and walked out by female models. 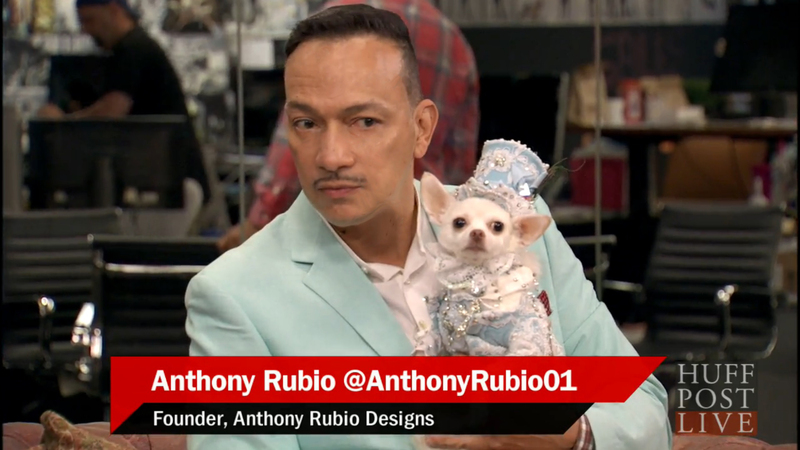 Mr Rubio became the sole designer for the show’s mascots Bulldogs Maximus and Spartacus for the entire first season. 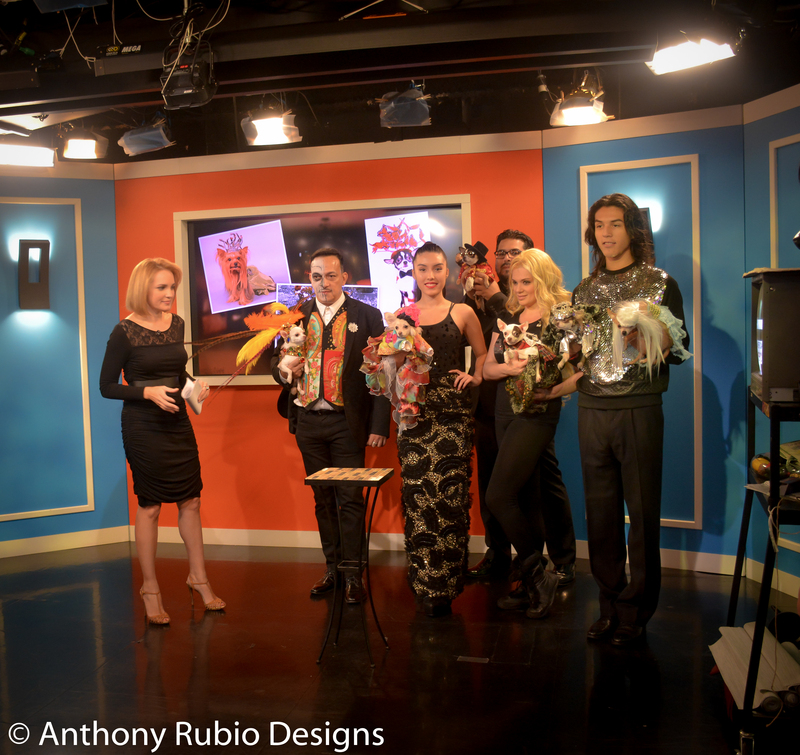 Internationally acclaimed Pet Couturier Anthony Rubio’s interview on Edicion Digital New York with Rafael Bello and Patricia Fuenmayor on Univision Nueva York. 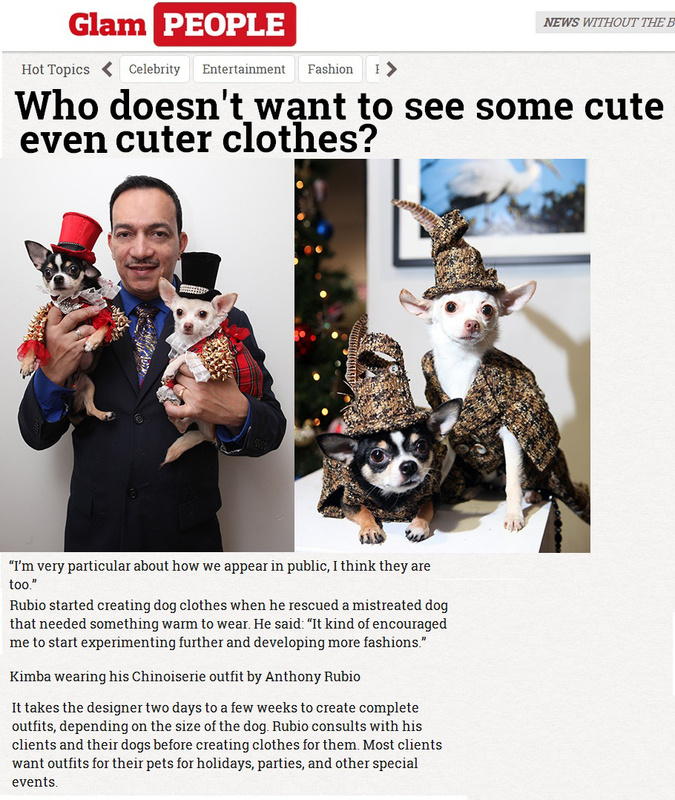 The interviewed is about Anthony Rubio’s Canine Couture, Women’s Wear, his inspirations, his story on how and why he broke the barriers to be the first pet fashion designer to have presented during any New York Fashion Week. 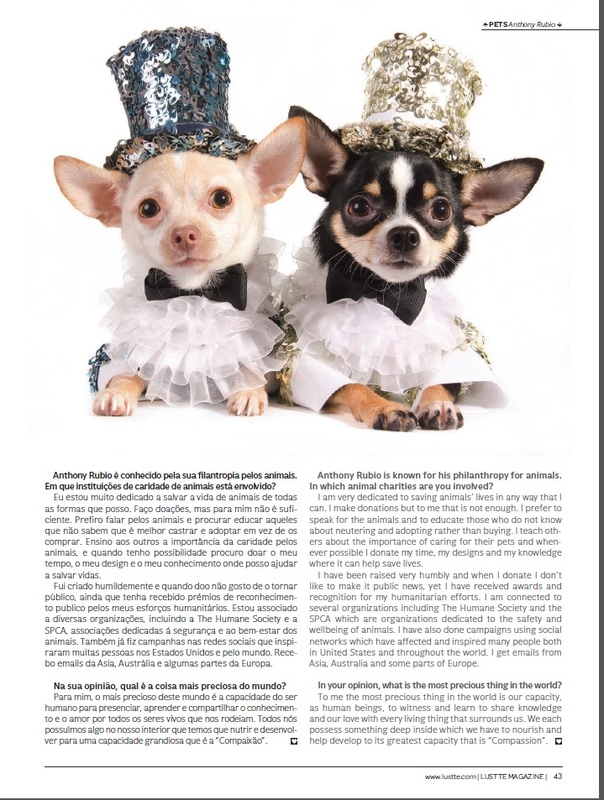 Anthony Rubio sat down for an extended interview with features editor Joanna Rothkopf of Jezebel to discuss his canine couture, women’s wear and his recent runway show for New York Fashion Week. 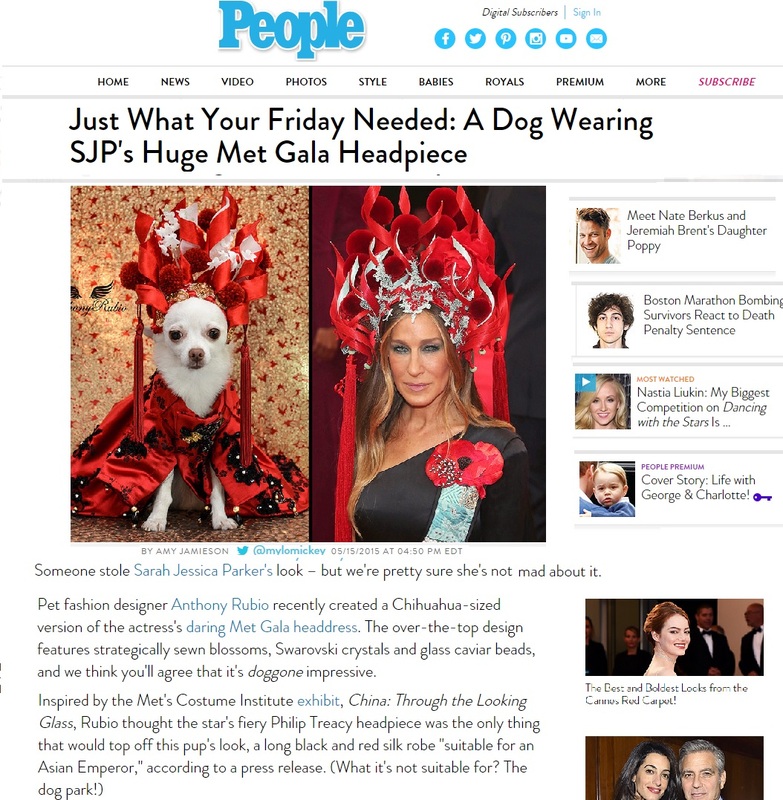 Anthony Rubio Designs featured in People Magazine. 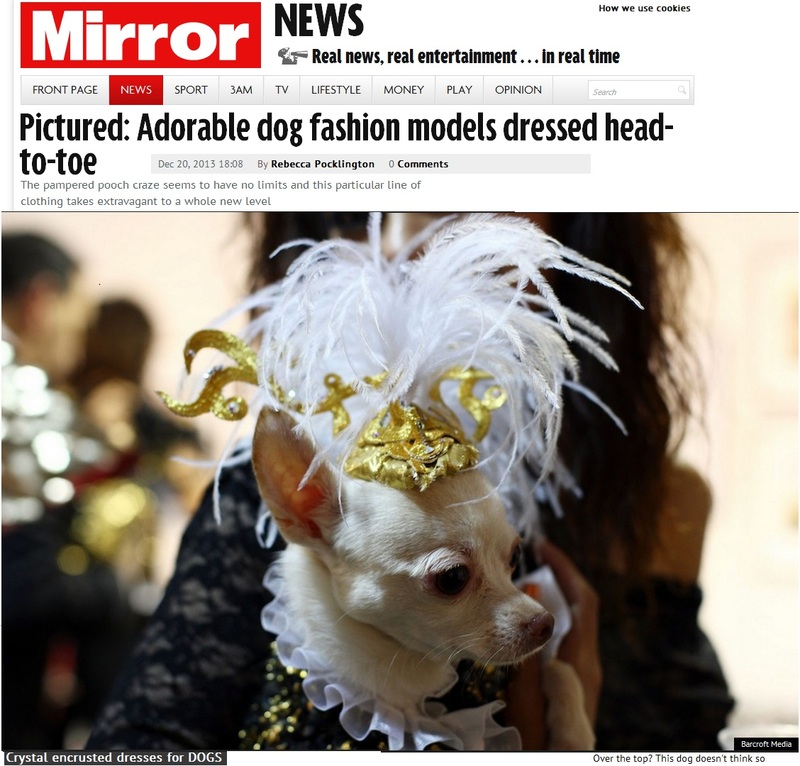 Inspired by the head piece worn by Sarah Jessica Parker to the Met Gala.‪ #‎Chihuahua‬ Kimba is wearing Canine Couture by Anthony Rubio Designs. Anthony Rubio’s Interview on Australia’s morning show Sunrise. From a TV studio in New York for a live interview for Australia’s morning show “Sunrise” with host David Koch and Samantha Armytage on the Seven Network via satellite. 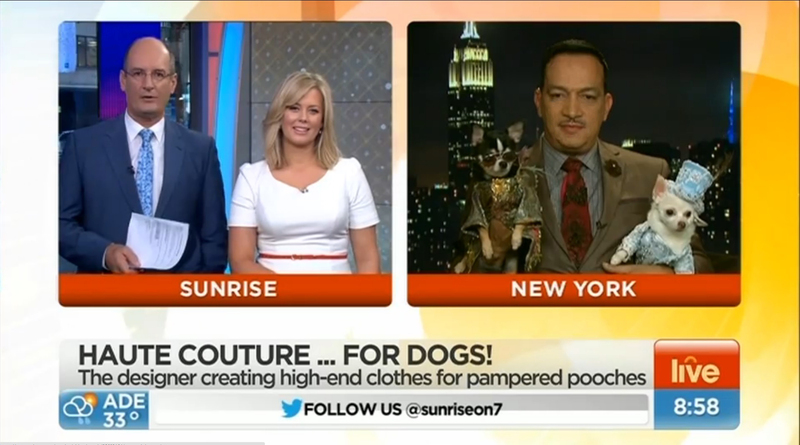 Here is the full video of my interview on Australia’s morning show Sunrise. Here are some behind-the-scenes photos and stills of my interview on Huffington Post Live. My second appearance on the show. 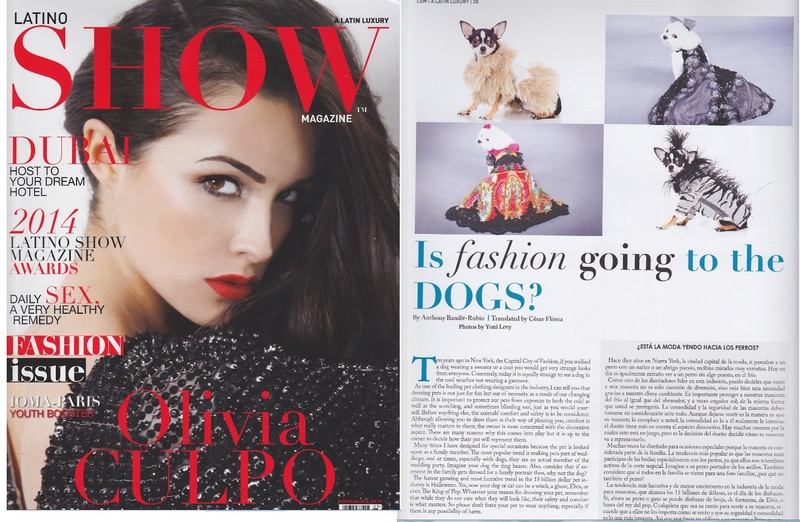 We discuss my runway show at Style Fashion Week and of course my canine couture. 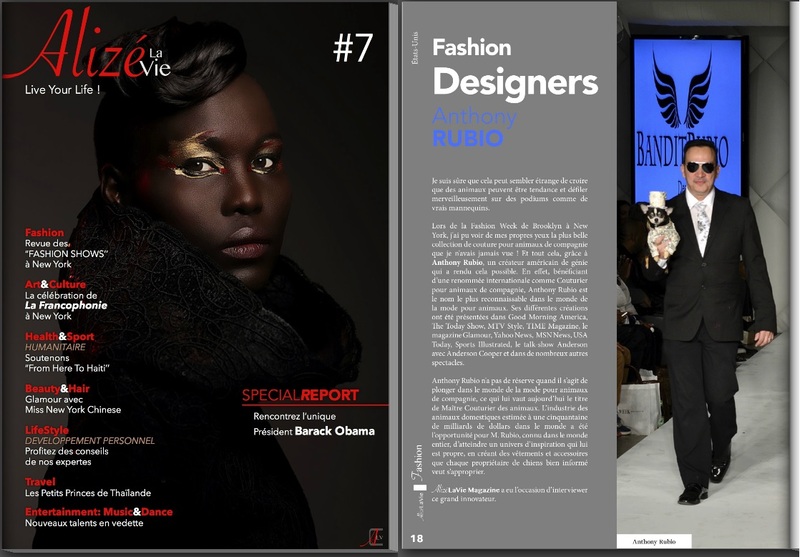 Anthony Rubio Designs in HUF Magazine! 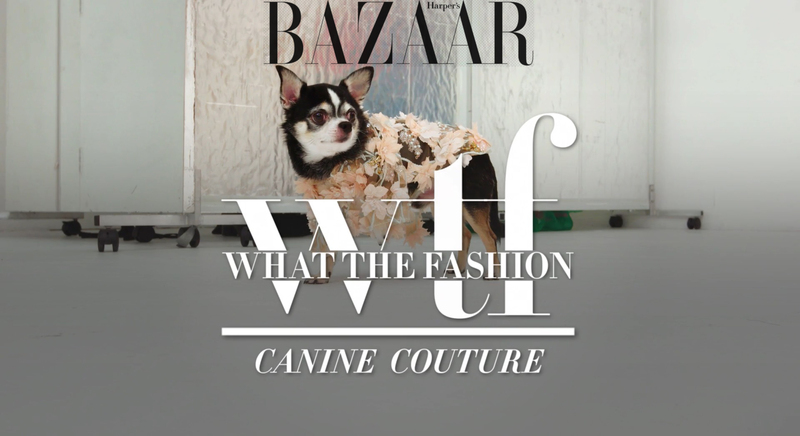 Fashion Editorial with Women’s Wear and Canine Couture by Anthony Rubio. 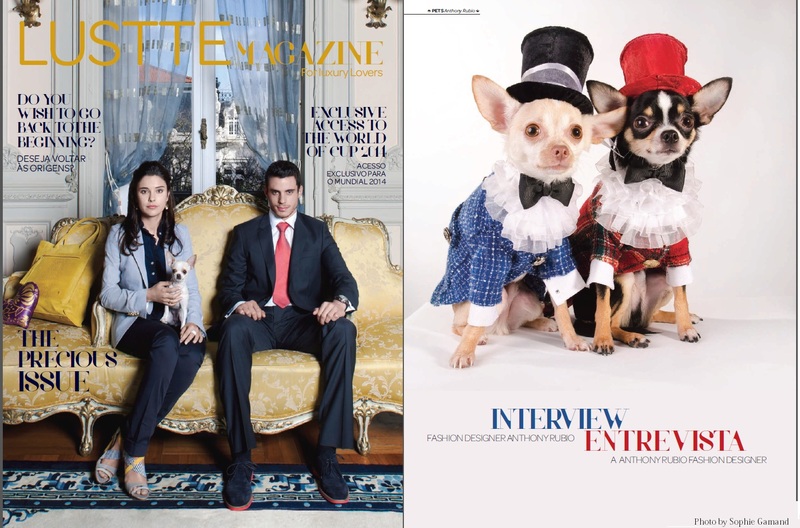 The photos of Anthony’s creations for both humans and canines were captured by Mouhsine Idrissi Janati. 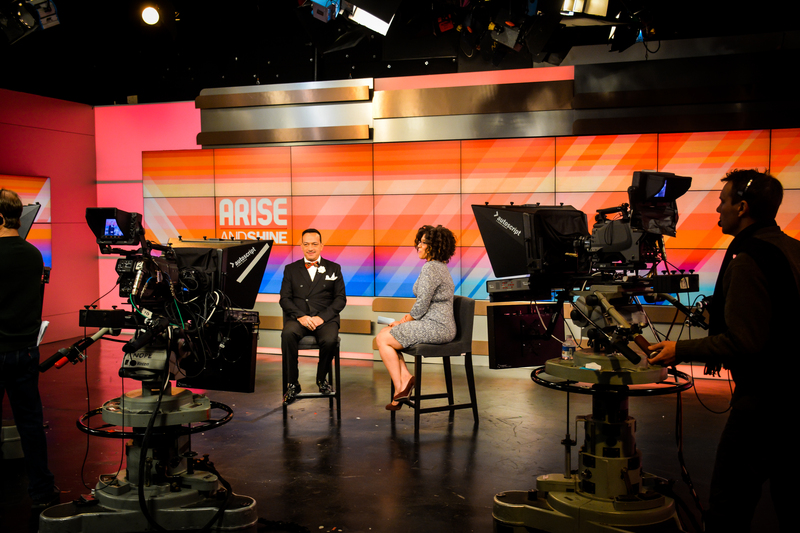 Designer Anthony Rubio’s live interview on the morning show Arise and Shine on the Arise network (Time Warner) with hosts Priya Sridhar and actress Rain Pryor (daughter of Richard Pryor). Designer Anthony Rubio created red carpet looks for the Golden Globes special of Talk Stoop with host Cat Greenleaf. 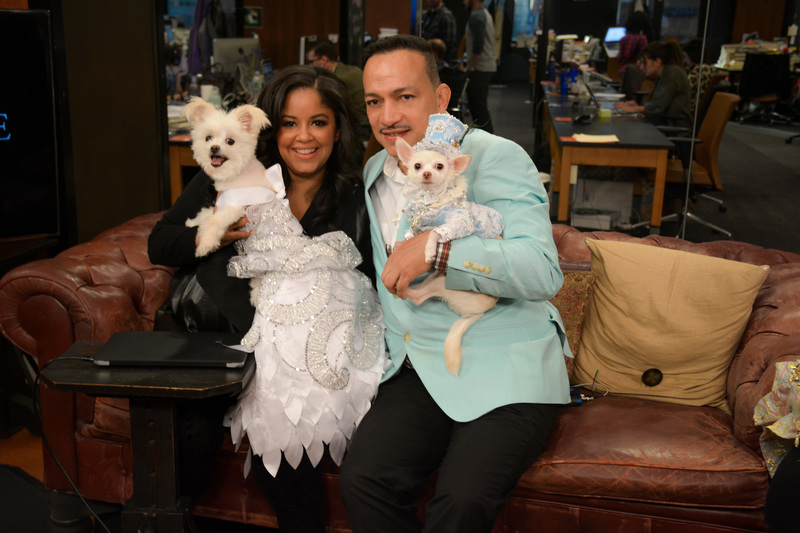 The co-host, the adorable Bulldog Gracie wore three beautiful gowns by Anthony Rubio. Special guest is Stacy London. Anthony Rubio Designs Featured on Instagram’s Official Account. 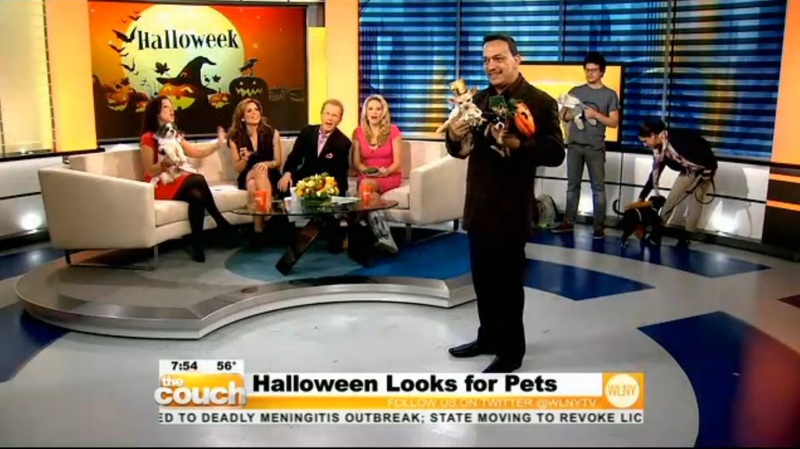 Anthony Rubio appeared on CBS’ morning show “Live from the Couch” with Bogie & Kimba for their Halloween Costume For Dogs segment with Wendy Diamond. He was asked to design 3 outfits with materials under $10 each. He designed Baby Hope (Katy Perry), Bogie (the scared Jack-o-Lantern) and Kimba ( Egyptian Pharoah’s Mummy) costumes. Here is the link to the video of his appearance on CBS. 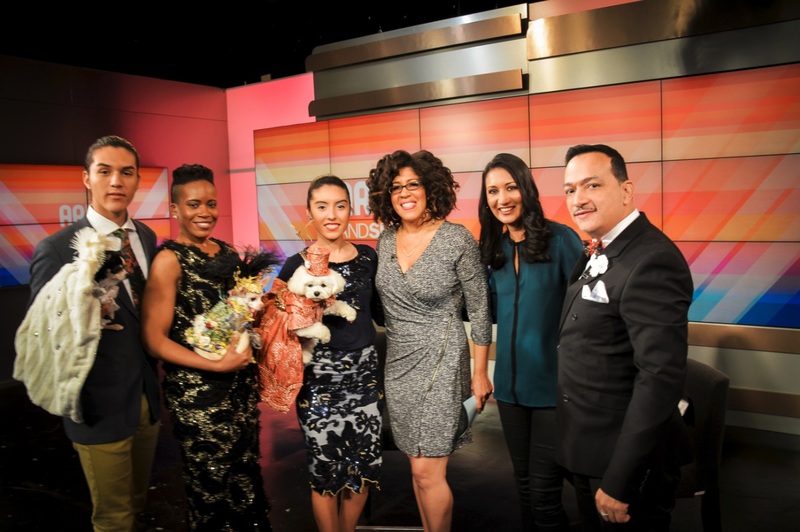 Anthony Rubio appeared on Good Day New York on the Fox Network as part of Celebrity Catwalk’s promotion for the Tinsel & Tails benefit for NYC Homeless Animals. All designs featured during the segment are by Anthony Rubio. 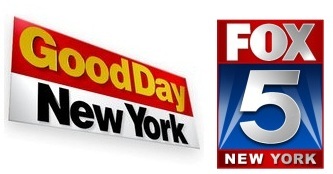 Here is the video clip of his appearance on Good Day New York. Click HERE. 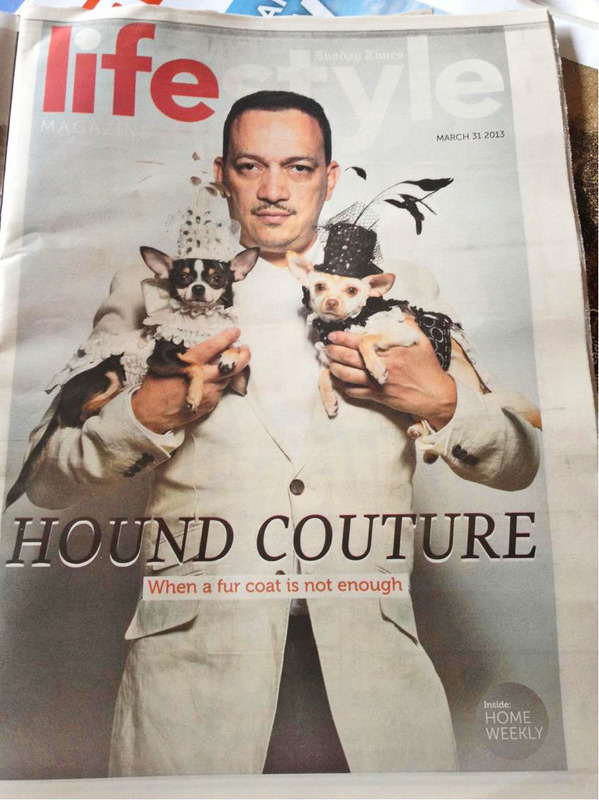 Anthony Rubio’s full page cover in The Sunday Times, South Africa’s largest newspaper. 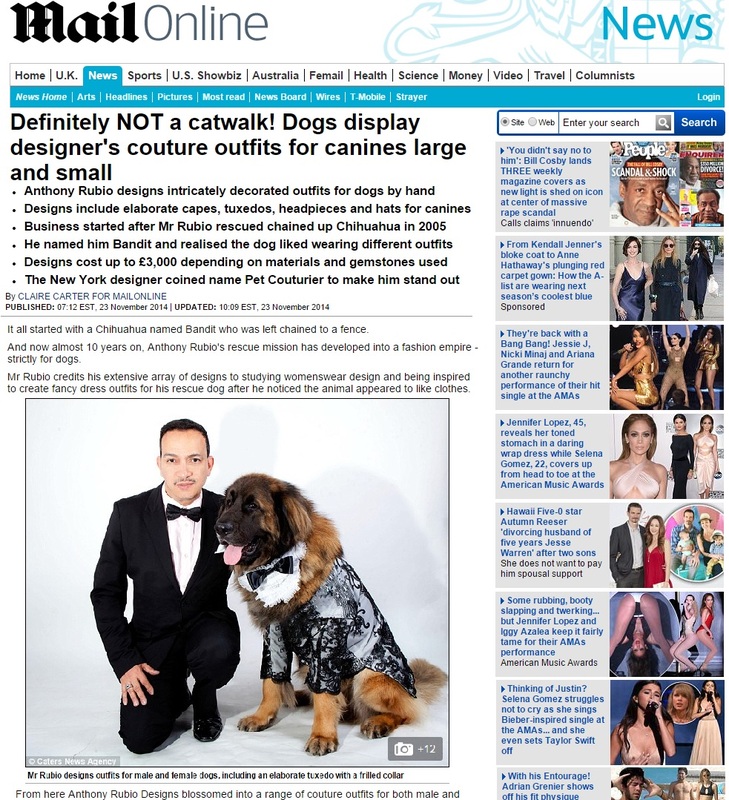 The article include Anthony Rubio’s designs in the book Couture Dogs of New York. Hard copy circulation is 504,000 and online weekly readership is 3.2 million. 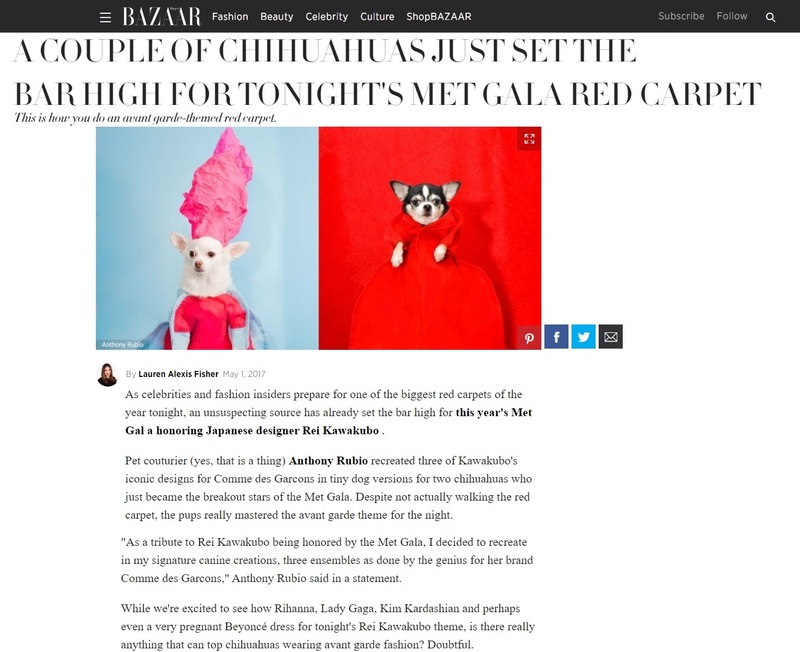 Anthony Rubio and his one-of-a-kind creations were featured in Glamour Magazine. This would be his second time in the magazine. Read the article by clicking the link below. Well today is the official beginning of the Year Of The Dog in the Chinese Zodiac. Ranking as the eleventh animal in Chinese zodiac, Dog is the symbol of loyalty and honesty. People born in the Year of the Dog possess the best traits of human nature. They are honest, friendly, faithful, loyal, smart, straightforward, venerable and have a strong sense of responsibility. Dog is in fact man’s best friend. Bogie and Kimba are no exception and are recognized wearing custom celebratory garments to bring in the New Year. 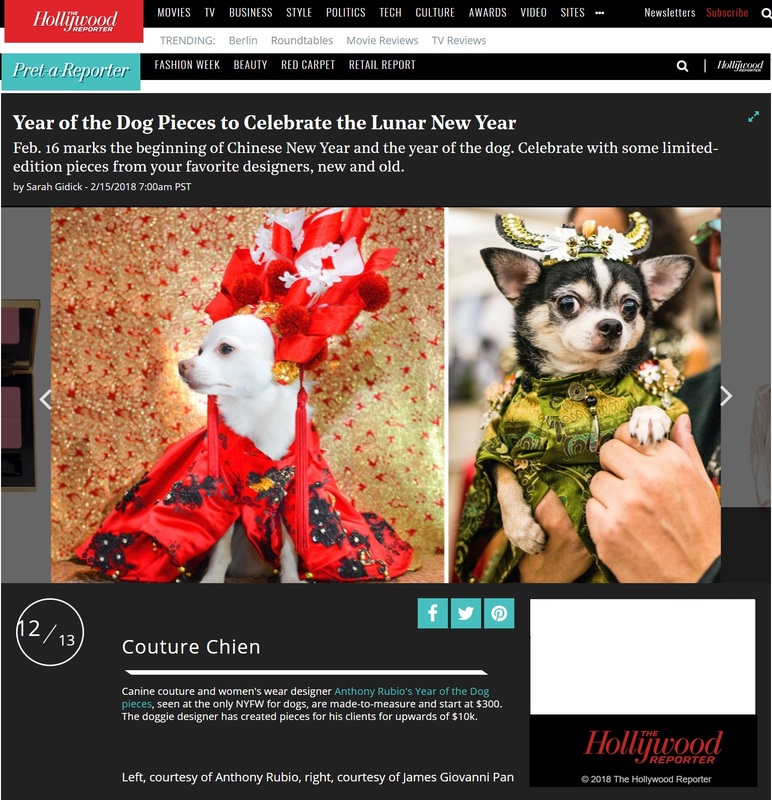 Anthony Rubio Designs featured in The Hollywood Reporter magazine’s showcase of luxury products to ring in the Lunar New Year celebration. 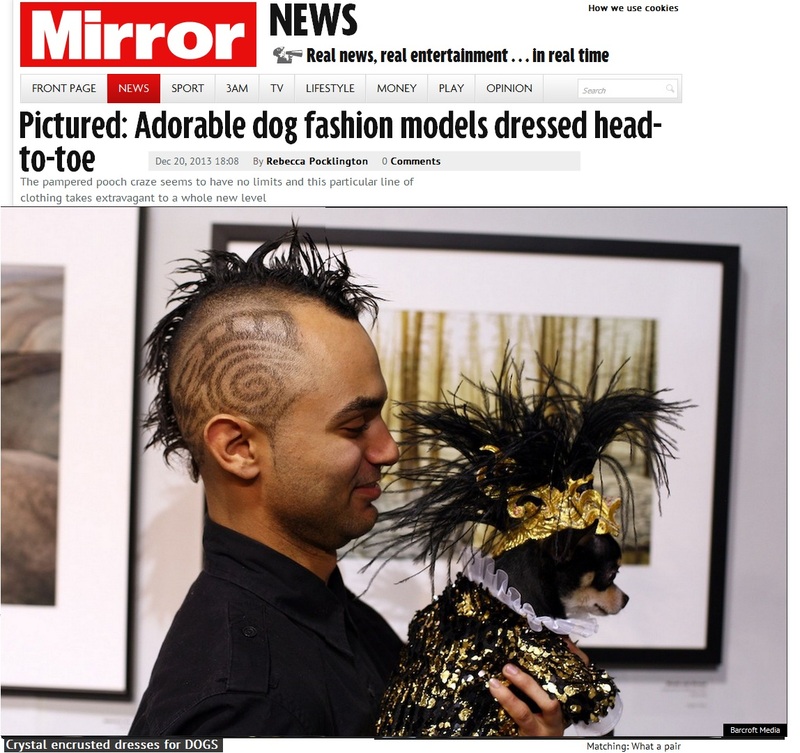 Press coverage from the New York Post of Anthony Rubio’s Fashion Show at Fashion Week Brooklyn. His couture creations were featured in 20 picture gallery. Read the article by clicking the link below. 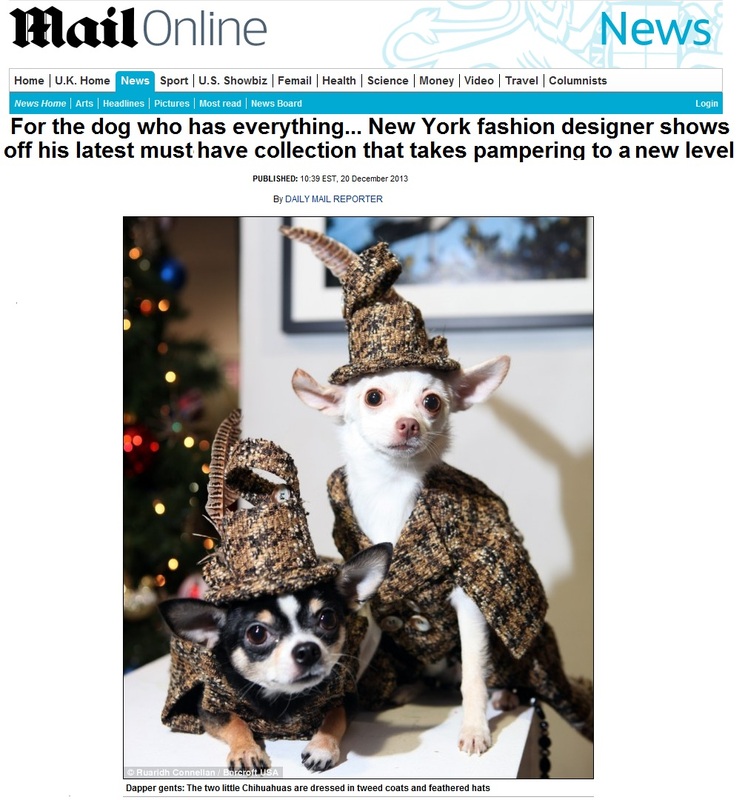 Dog Fashions of Anthony Rubio featured in The Daily Mail. November 2014. 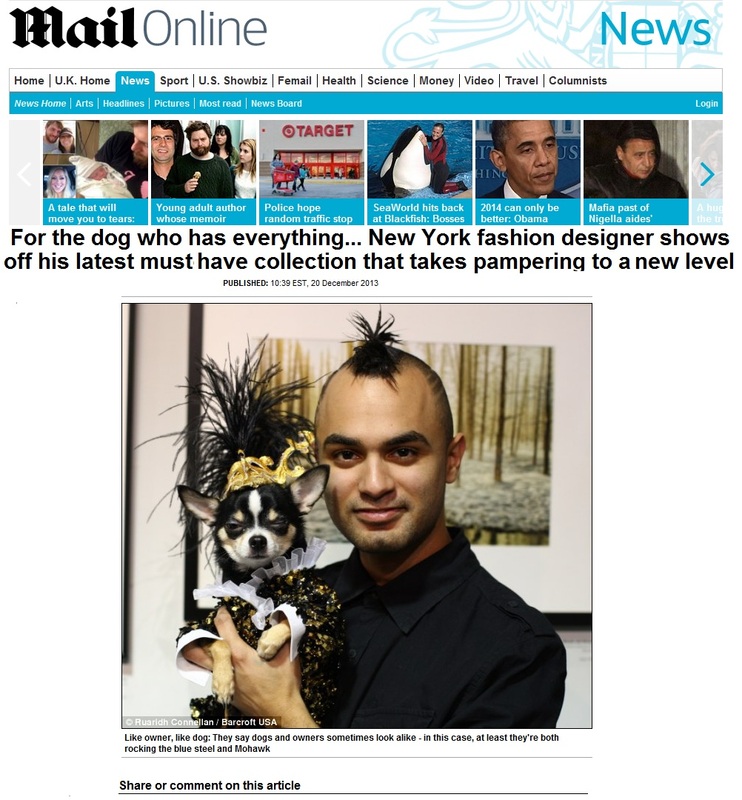 The Daily Mail article covers the beginning with his Chihuahua Bandit and his award-winning designs with his company Anthony Rubio Designs. World’s Richest Dogs is a one-hour special of the countdown of the 10 richest dogs in the world. In between the countdown they showcase fives dogs living the fabulous life. 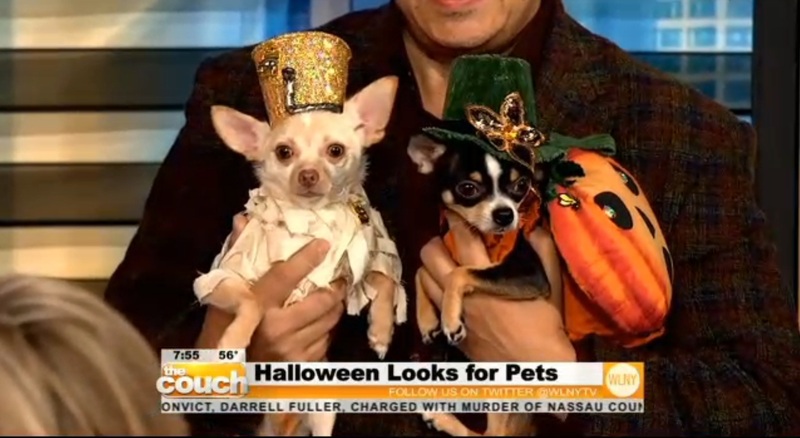 Anthony Rubio’s Chihuahuas Bogie and Kimba have their own segment. Anthony Rubio was interviewed as their parent for one feature and interviewed as a designer for another segment in the show. 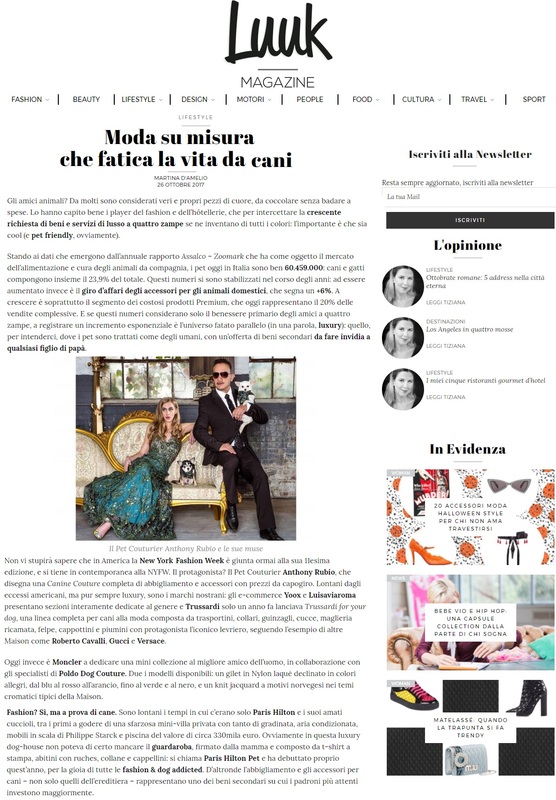 Italian magazine LUUK published an article about the rise on the demand of luxury goods for pets. 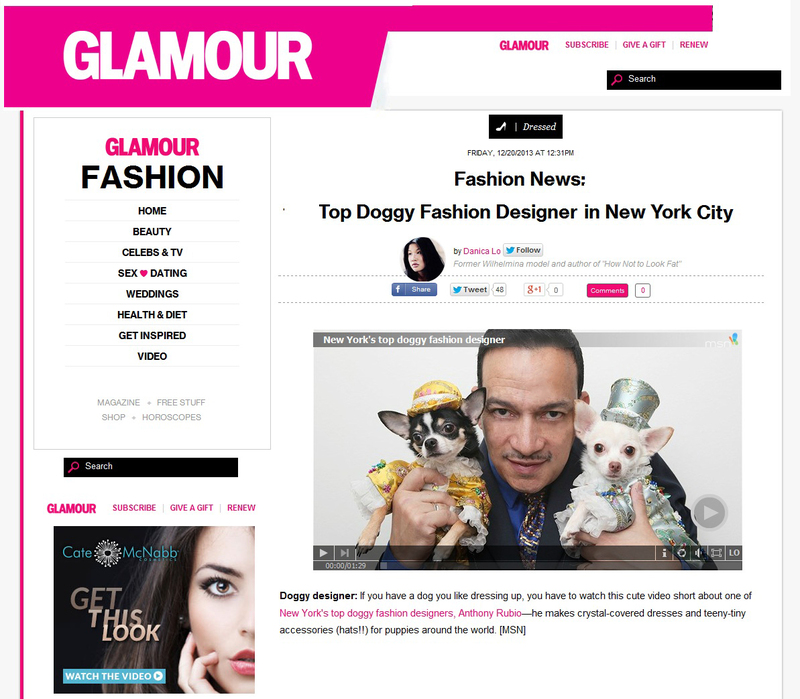 They spotlighted Anthony Rubio Designs along with brands like Gucci, Versace and Cavalli who have added canine lines to their brand. 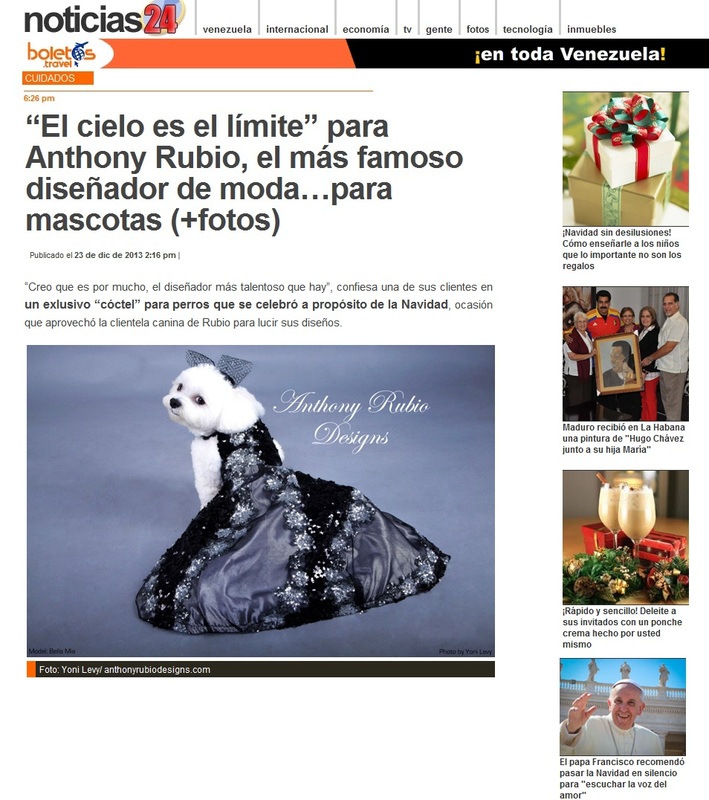 Anthony Rubio Designs had a featured article in COSAS Magazine. A fashion magazine based in Perú celebrating their 25th anniversary. 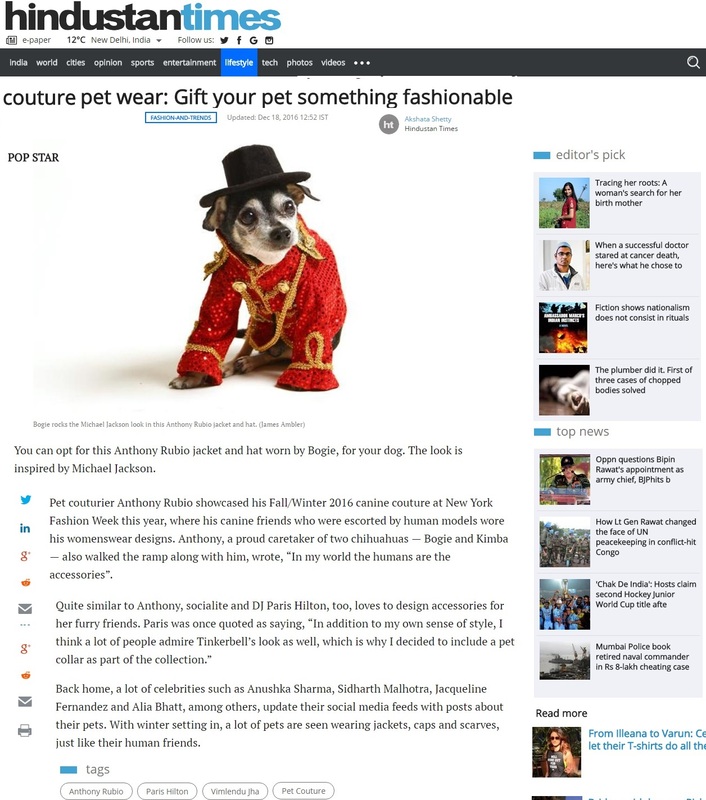 The interview covered his High End Pet Fashions in the article about Luxury Goods for Pets. Anthony Rubio in Dogster Magazine. Hey everyone! 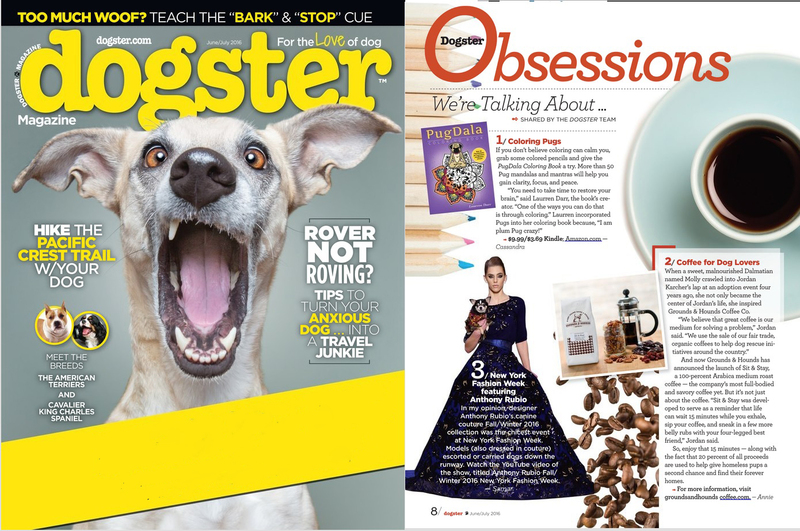 We are in the June/July 2016 issue of Dogster Magazine. 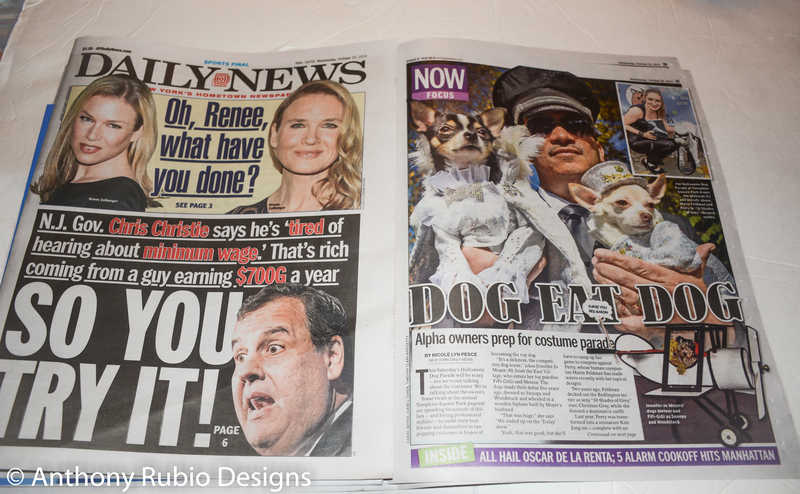 They are “Obsessed” with Anthony Rubio Designs’ New York Fashion Week presentation. 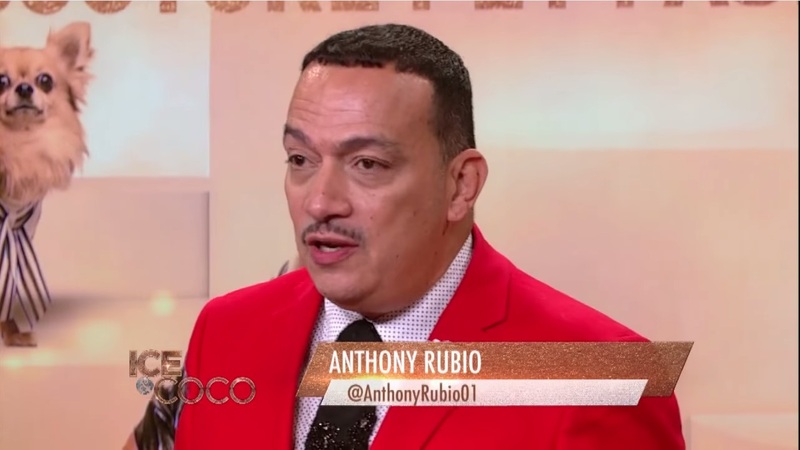 Anthony Rubio Interviewed on the Halloween Edition of Telemundo’s Morning Show. 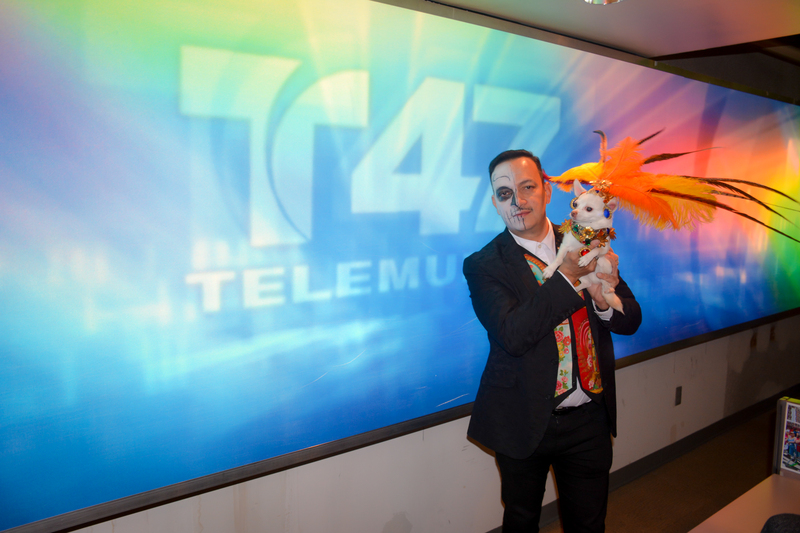 Anthony Rubio showed a variety of his Halloween creations on the Spanish-speaking morning show on Telemundo. 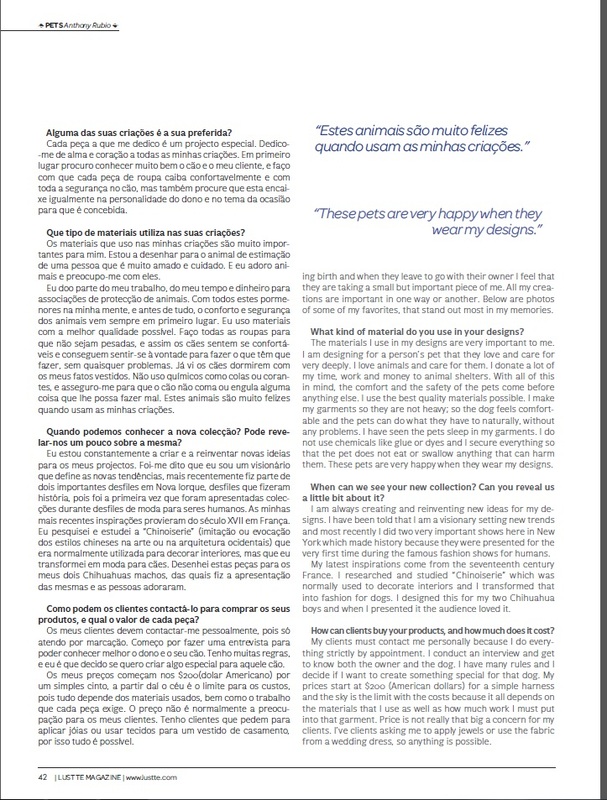 Anthony Rubio was interviewed and given a four page spread in the May issue of Lustte Magazine, a luxury brand magazine out of Lisbon, Portugal. The interview is in Portuguese and translated to English. The photos used in the article were taken by Sophie Gamand of Striking Paws. 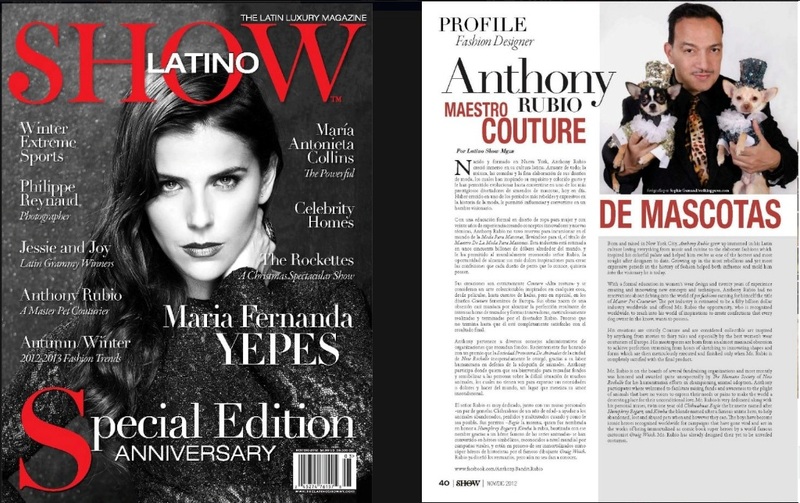 Anthony Rubio was interviewed for The Latino Show Magazine for their 1st Year Anniversary issue. His name is on the cover. The magazine held a Gala celebration at the Museum Of the Moving Image to celebrate the Anniversary issue. You may read the entire article in English or in Spanish as it appeared in the First Year Anniversary Issue of The Latino Show Magazine. Photo by Sophie Gamand. 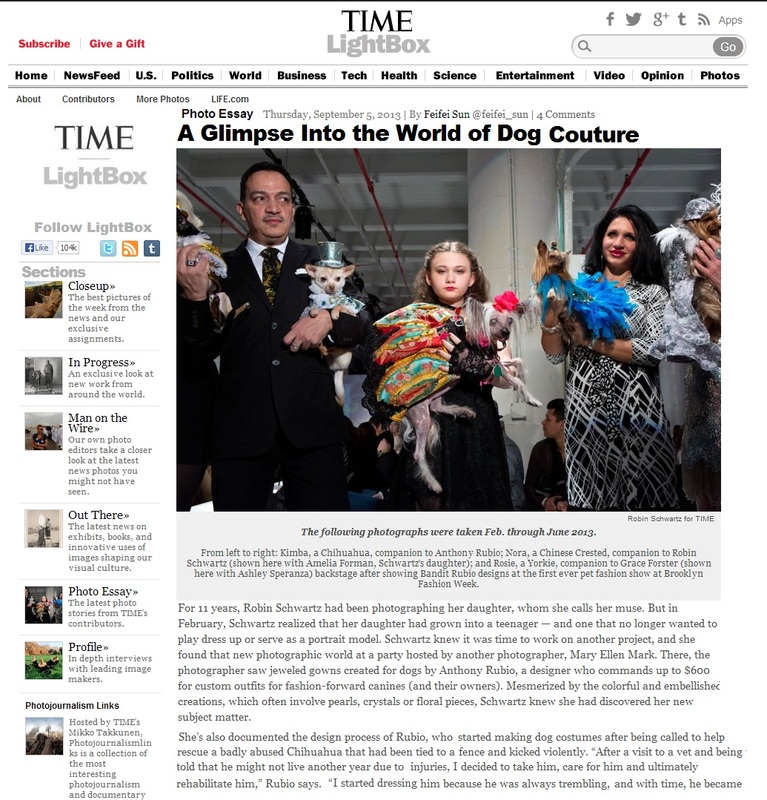 Anthony Rubio’s fashion show at Fashion Week Brooklyn was covered by TIME magazine and was interviewed about his designs. Article by Feifei Sun. Photographs by Robin Schwartz. My interview and photo essay in TIME Magazine’s Lightbox is now up. We discussed my designs and recent Fashion Show at Fashion Week Brooklyn . Thank you Feifei Sun for the article and photographer Robin Schwartz for the amazing photos and photographer Mary Ellen Mark for the introduction. 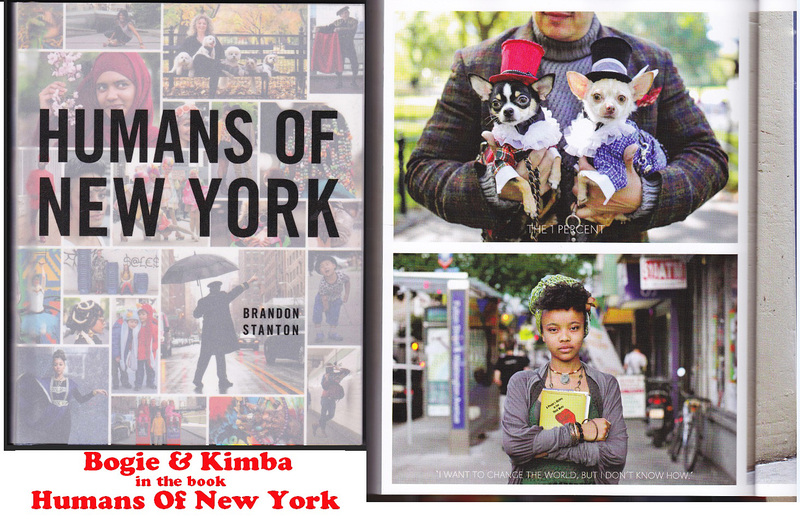 My Chihuahuas Bogie and Kimba wearing my designs are featured in the just released book “Humans of New York” by Brandon Stanton. A No. 1 selling book on the New York Times chart. Anthony Rubio: Although I am in the 99 percent, but I make sure my dogs live the life of the 1 percent. 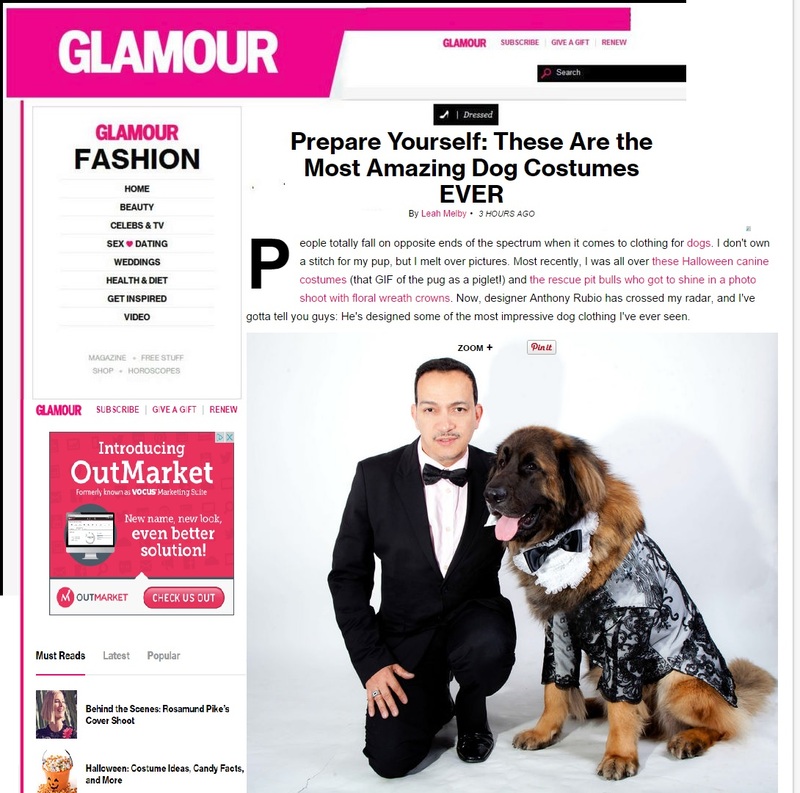 Anthony Rubio’s interview is now on GLAMOUR Magazine’s website. 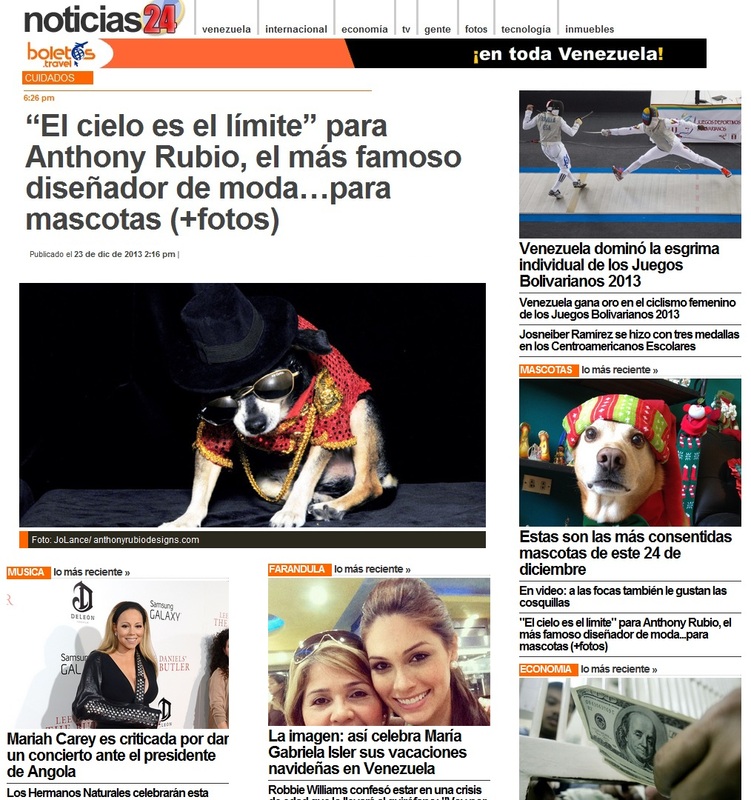 Pet Fashion designer Anthony Rubio’s runway show for New York Fashion Week was covered by TV Network Bravo. 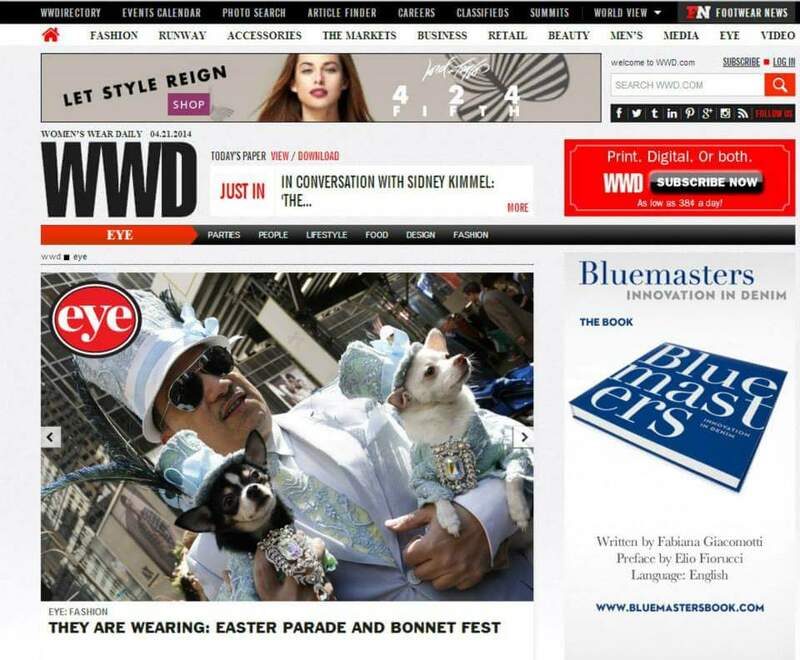 Women’s Wear Daily did an article on millinery and had a section on hats for dogs. 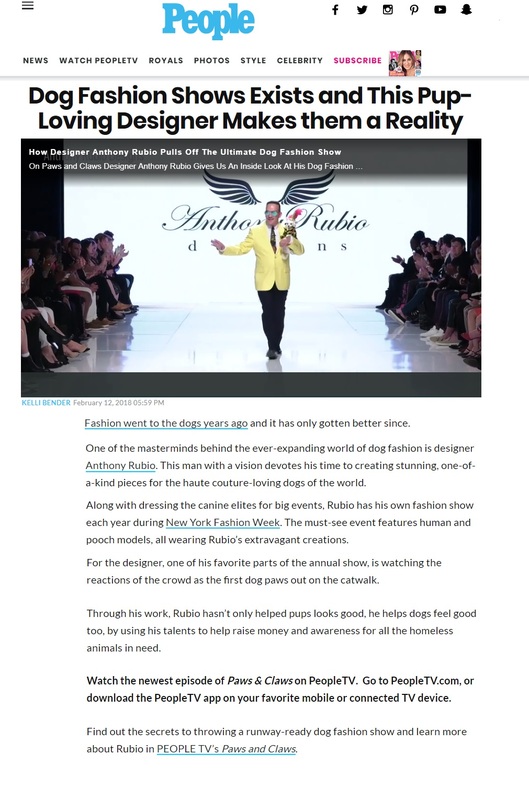 Anthony Rubio was interviewed on the creations for dogs. In this photo, Anthony made his top hat as well as those on Bogie and Kimba, Chihuahuas. Woman Magazine Issue 49, a fabulous luxury magazine released their 2017 Holiday Edition. Anthony Rubio Designs has been so well received world-wide and embraced by the fashion community which warms my heart and helps me demonstrate that with imagination, determination and perseverance you can make your dream come true. Anthony Rubio Designs NYFW 2018 Fall/Winter presentation covered by BuzzFeed. 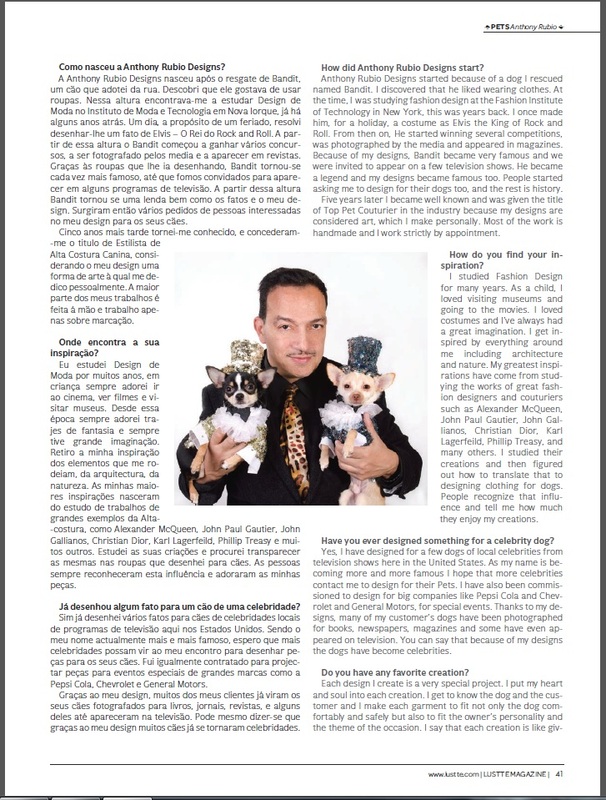 Anthony Rubio in “Dogster” Magazine! 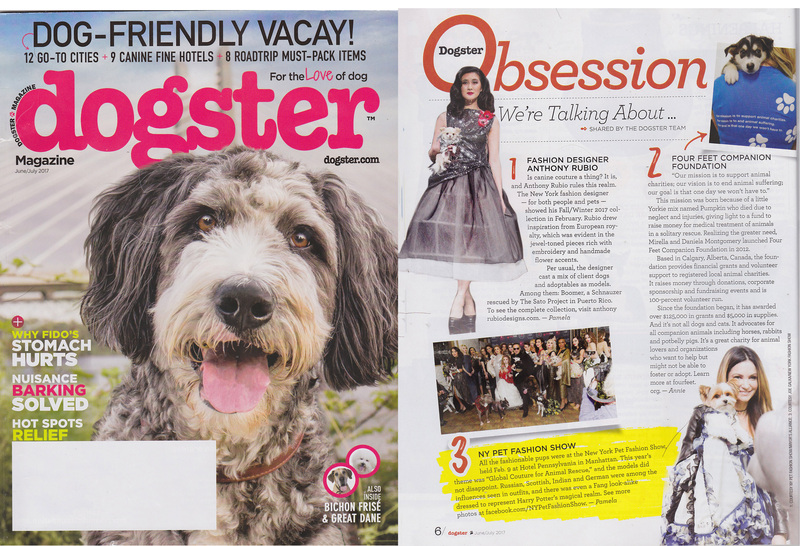 Anthony Rubio’s Runway Show for New York Fashion Week featured in the June/July issue of Dogster Magazine in their Obsessions column. Hindustan Times is an Indian English-language daily newspaper founded in 1924. Also featured in the print edition. Anthony Rubio Interview in The Daily Mirror U.K.
Anthony Rubio Interview in The Daily Mail UK. From Anthony “I am so thrilled to learn that I am being celebrated for my creations and recognized world wide for my dedication and creativity over so much time. I feel Blessed”. The Daily Mirror has daily print circulation of 1,991,275 and over 80 million unique visitors per month to its website. 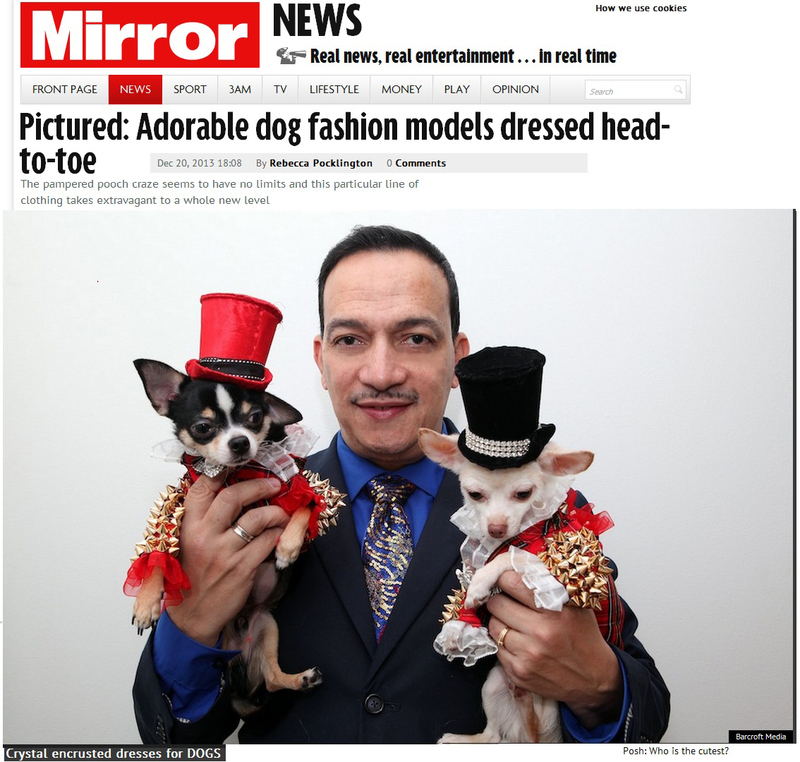 Anthony Rubio’s dogs Bogie & Kimba in The Daily Mirror U.K.
From Anthony Rubio’s Interview in The Daily Mirror U.K.
Anthony Rubio’s interview “New York’s Top Doggy Fashion Designer” is now up on MSN World News. We discussed my creations and more. Click HERE to view the interview. 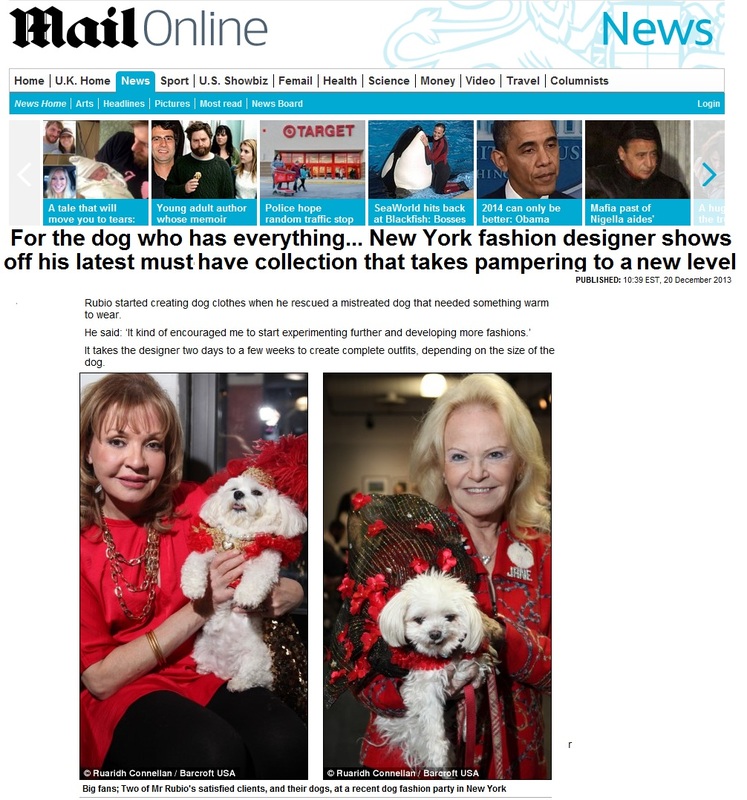 I am so elated and proud to share this article in The Daily Mail with all of you as it is being seen world wide. 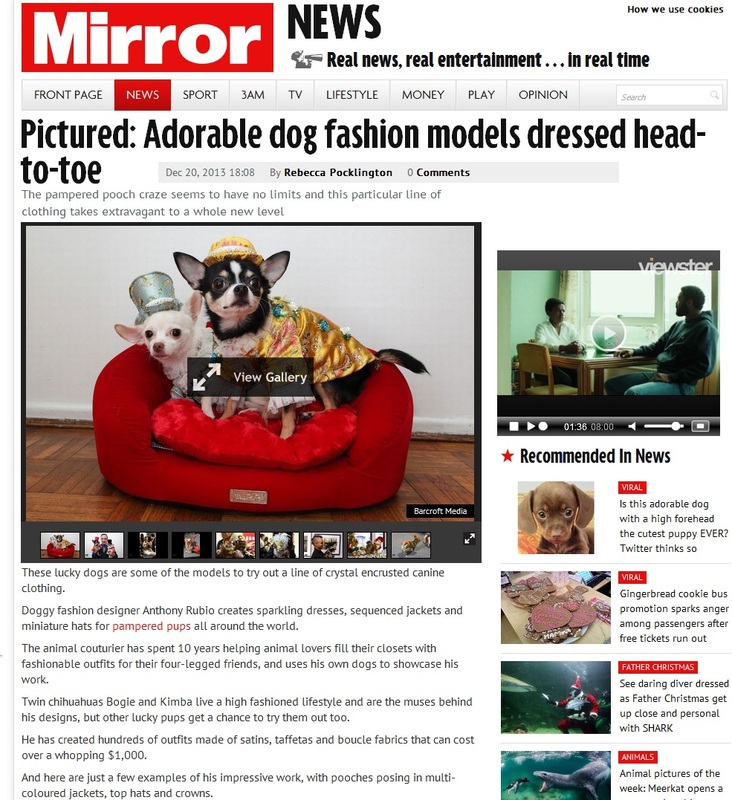 The Daily Mirror has daily print circulation of 1,058,488 and over 30 million unique visitors per month to its website. What a wonderful Christmas surprise! 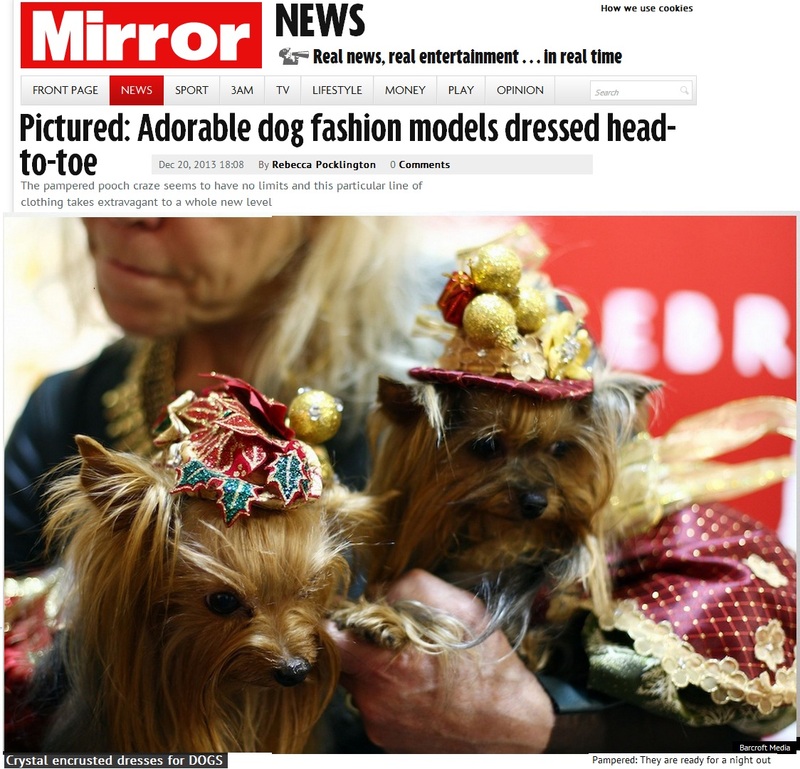 In today’s New York Post on page 24 is a festive photo of these adorable dogs all wearing my creations. 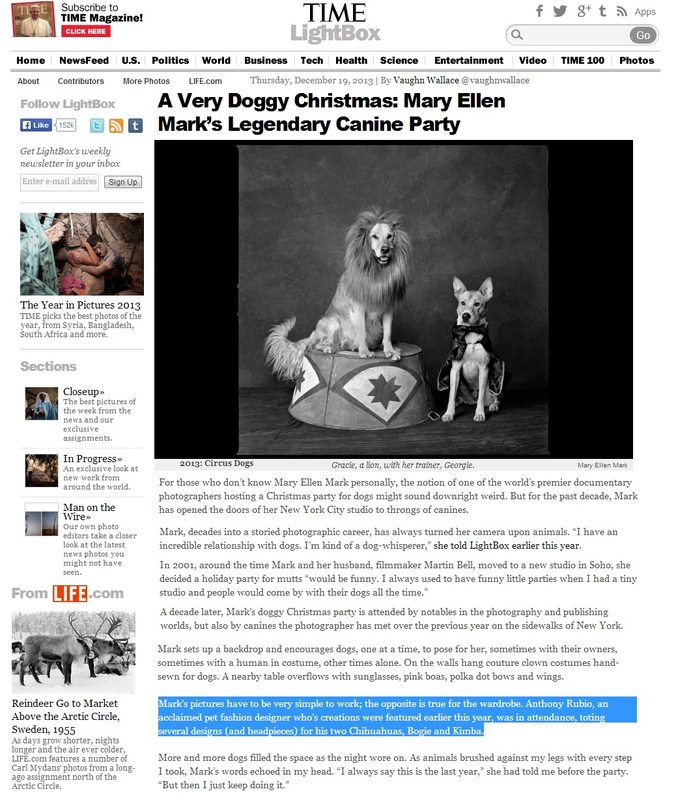 Last week, I had the pleasure of attending Mary Ellen Mark’s annual ‘A Very Doggy Christmas’ party, featuring a Circus theme photo shoot for the four legged guests. I was tapped to design theme referenced outfits for the party. 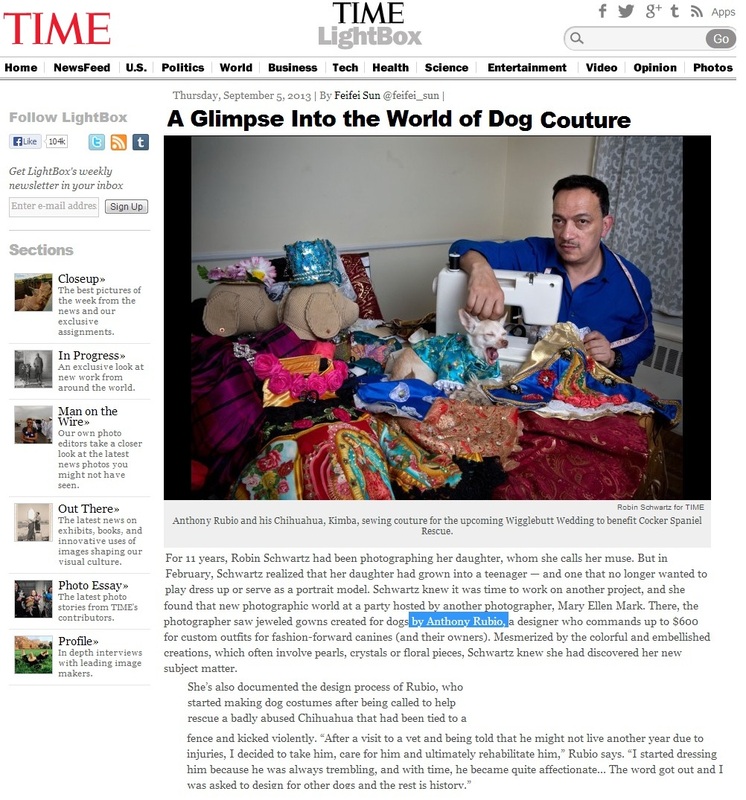 Vaughn Wallace wrote an article on the event for TIME Magazine’s Lightbox with additional photographs by Robin Schwartz. I am mentioned in the piece. Anthony Rubio featured in the UK Daily Mail. Photo taken at the 2017 New York Pet Fashion show. 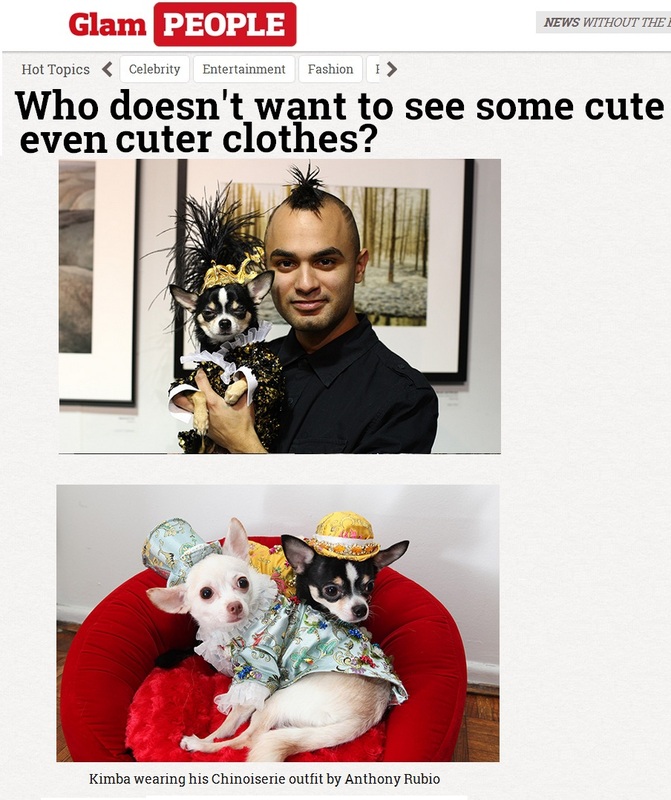 Anthony made his tie, Chihuahua duo Bogie and Kimba’s outfits and hats and child model Breilla’s gown. Anthony Rubio Interview in French Magazine Alizé La Vie. On the heels of my most recent and most prestigious fashion presentation at Fashion Week Brooklyn. I was cordially invited to be profiled in a hugely circulated international publication based in Paris. The publication released it latest issue today which features my interview and wonderful photos of some of my creations by fashion photographer Norman Ding. Ladies and gentlemen it gives me great pride to present to you my interview with Alizé La Vie Magazine. Recently I had the pleasure of being interviewed by Jody Miller-Young for her fabulous radio show. It was so much fun especially, as you will notice, when Jody asked just the right questions to trigger off the chatter box in me. Take a few minutes to listen and do enjoy getting to know more about me and how I come up with ideas for designing. 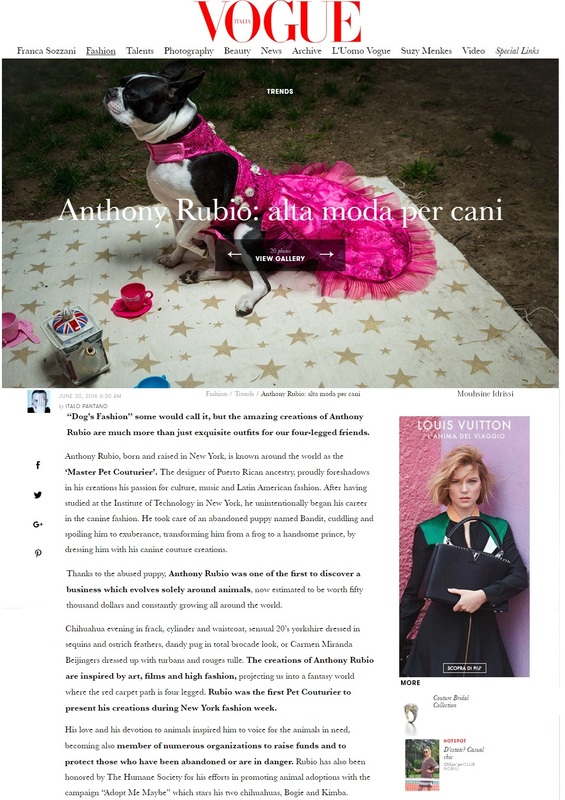 Anthony Rubio featured in JUST LUXE website. 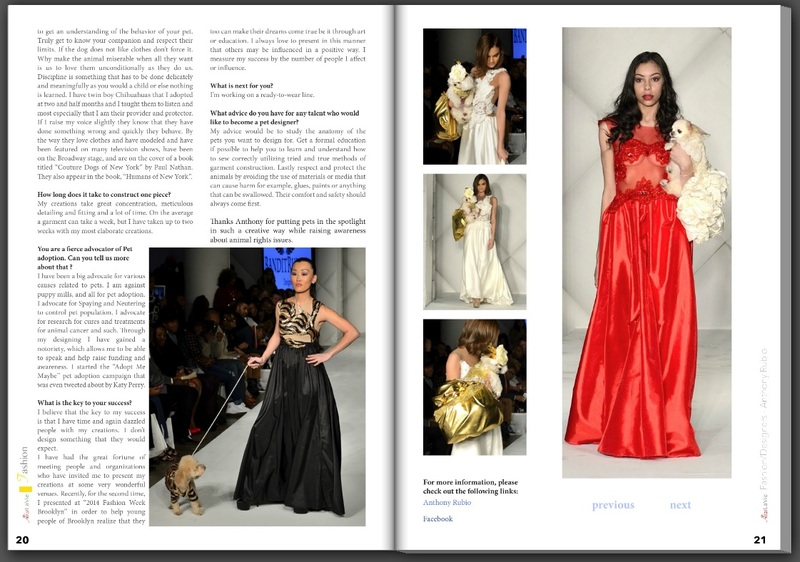 Anthony Rubio Designs featured in Just Luxe. An article about my Millinery. 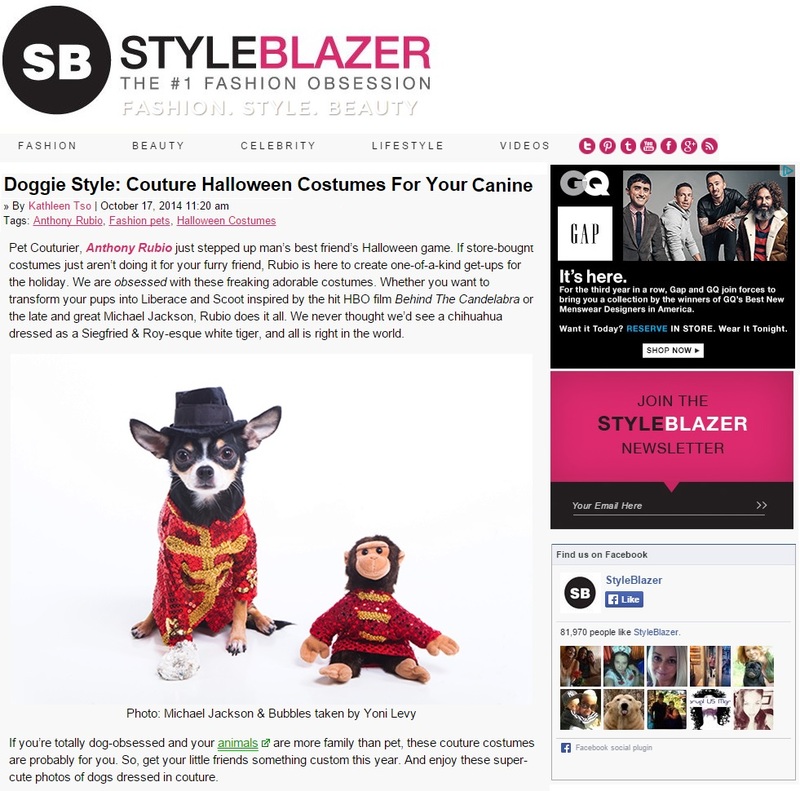 StyleBlazer did a feature on the Couture Halloween Costumes by Anthony Rubio Designs with 8 pages of photos. Anthony Rubio on the front page of BrooklynDaily’s Bay Ridge Courier. 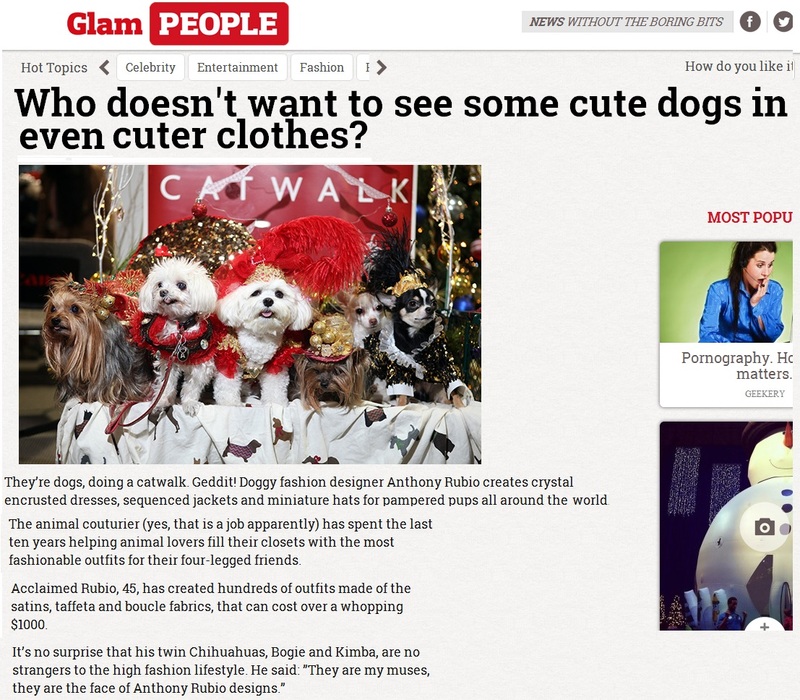 The article is about Bark Post’s Puppy Prom. 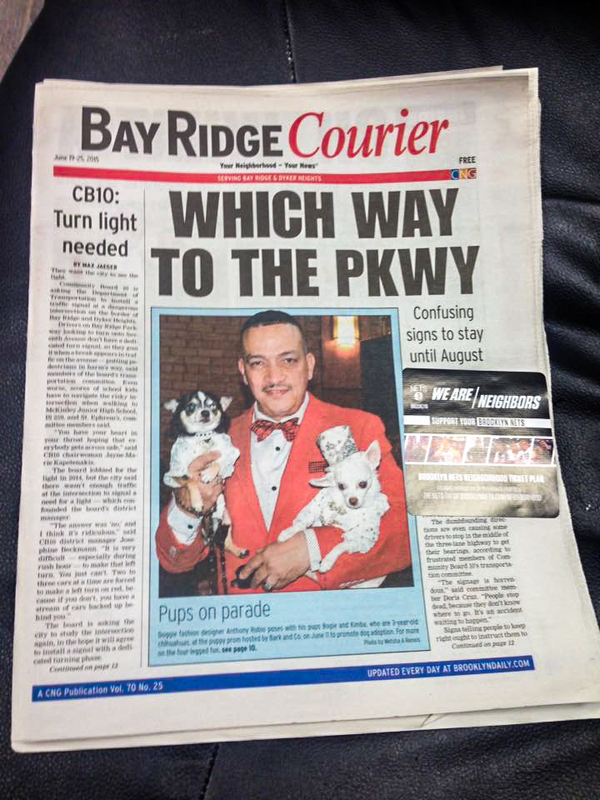 Anthony Rubio and his Chihuahuas Bogie and Kimba on the front page of BrooklynDaily‘s Bay Ridge Courier. The article is about Bark Post’s Puppy Prom. 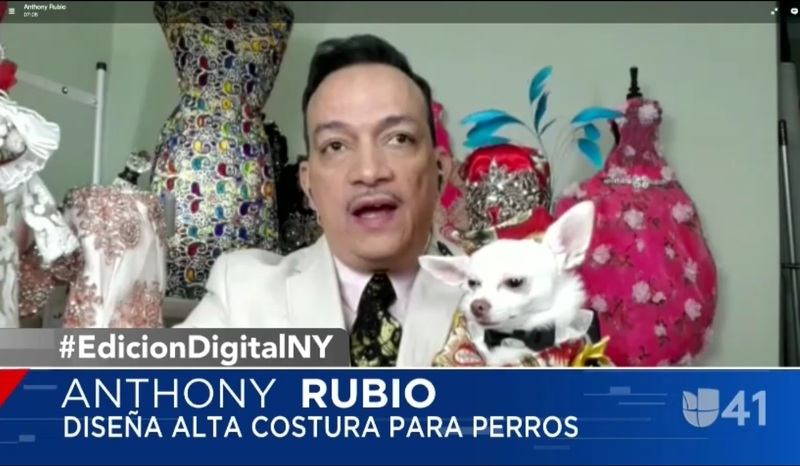 Anthony Rubio was interviewed about his award-winning Halloween costumes for dogs by New York Daily News and discussed winning the Tompkins Square Park Halloween Dog Parade. October 2014. 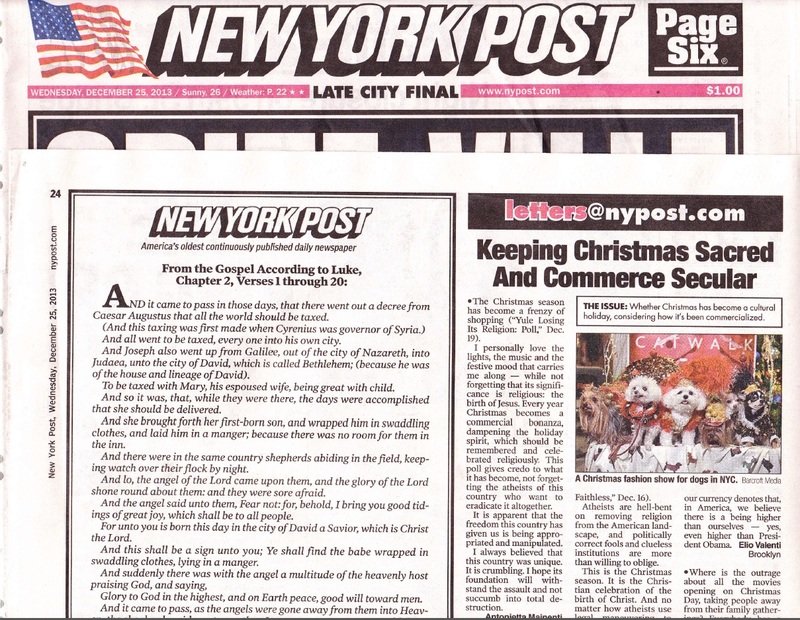 Anthony Rubio’s design of the Mad Hatter made it into the New York Daily News in 2009. The year was 2009. The event was the annual Macys Petacular. Bandit, a full year before the release of the Johnny Depp feature film, appeared as The Mad Hatter at the tea party. 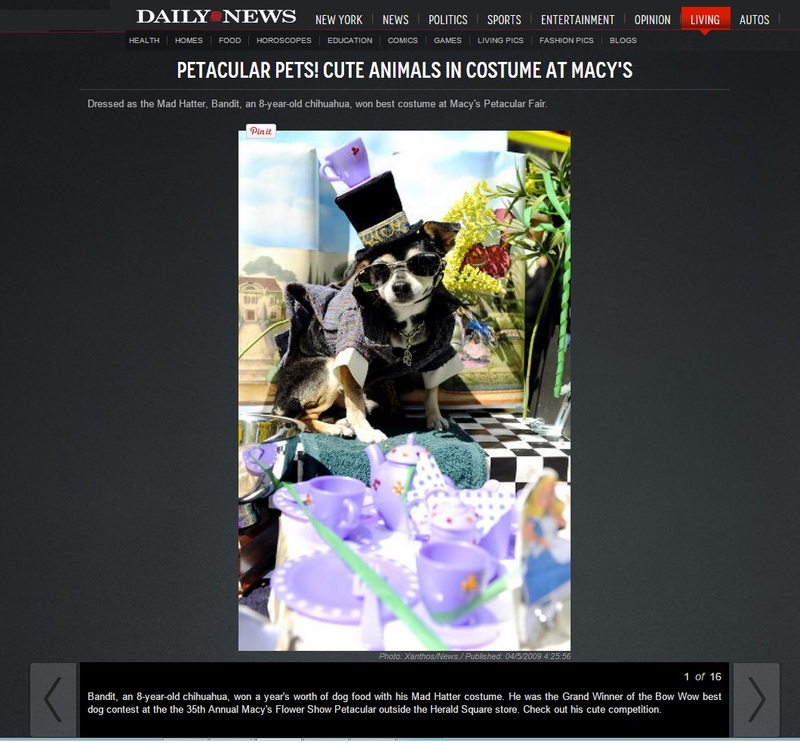 Bandit won the first of his two titles for Macy’s and this photo appeared in the New York Daily News in both the website and a full page in the print edition. Custom designed by Anthony Rubio. 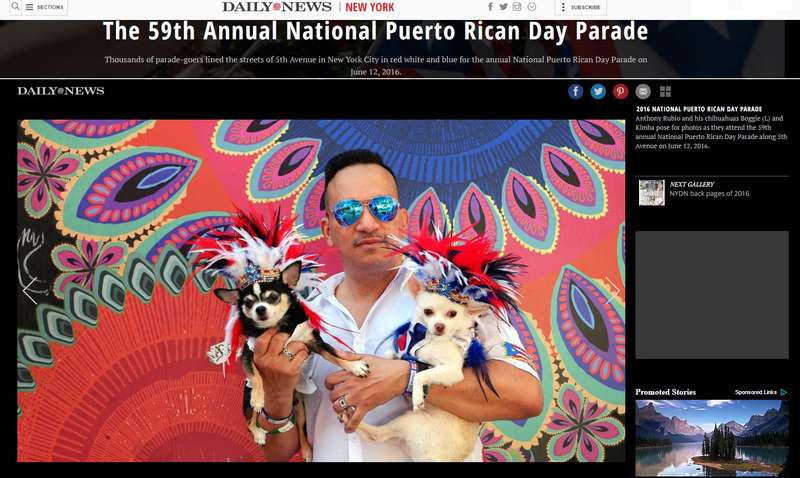 Anthony Rubio and his Chihuahua duo Bogie and Kimba featured in the New York Daily News on June 15th, 2016. Photo taken at the 59th annual National Puerto Rican Day Parade. 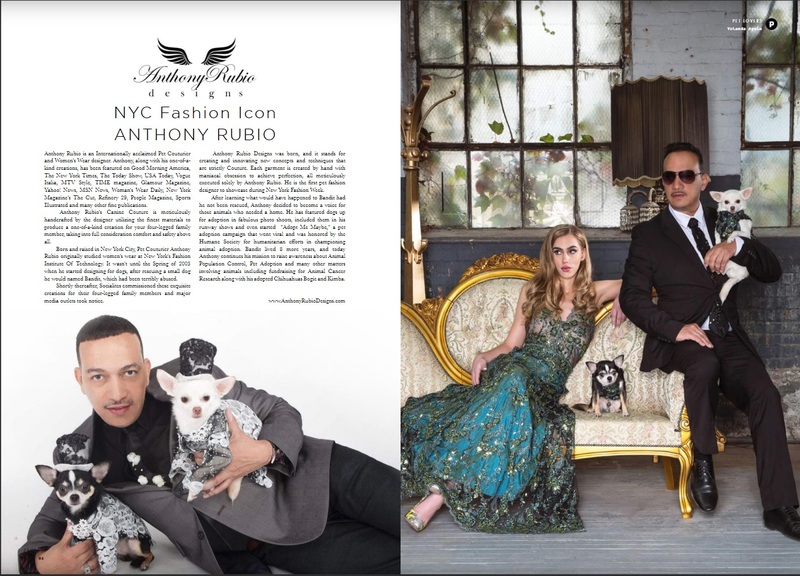 Anthony Rubio featured in FISIQUE Magazine in a two-page article on the Anthony Rubio’s 2016 Fall/Winter Collection, as presented during New York Fashion Week. 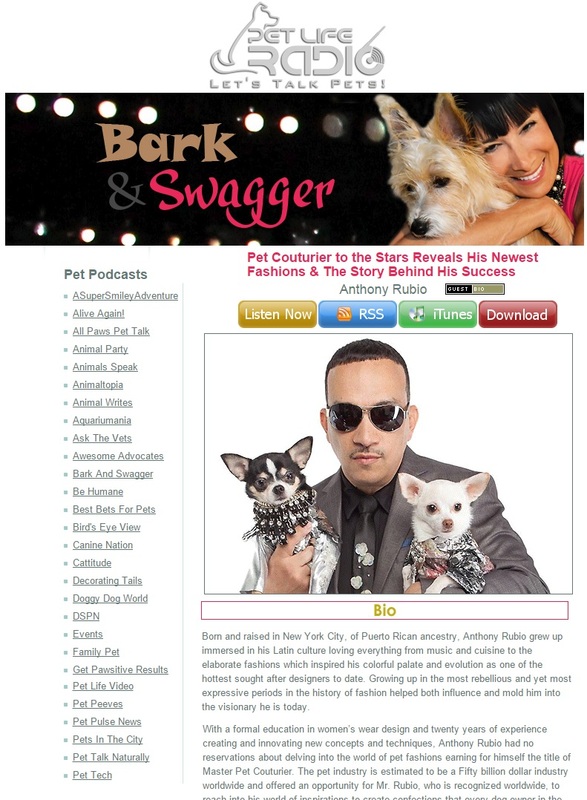 On the heels of Anthony Rubio’s presentation for New York fashion Week he was interviewed with the lovely Jody Miller-Young for her Bark & Swagger Pet Life Radio Show. They also discussed his future projects. Fresh Bark & Swagger radio show episode up now! 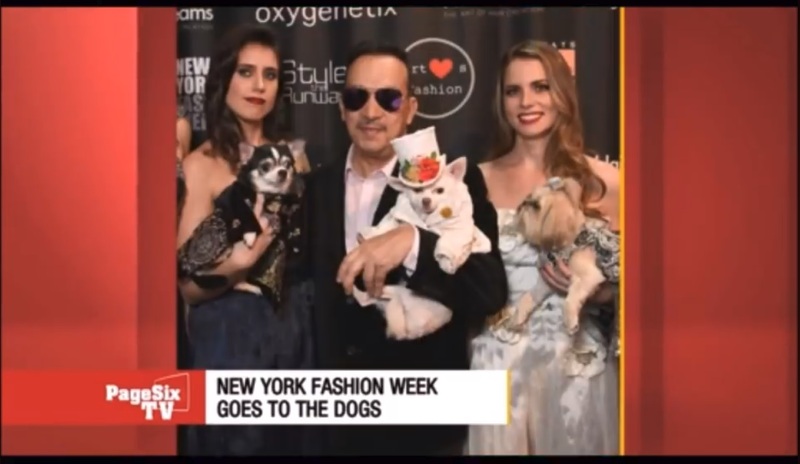 Get behind the scenes dish on pet couturier, Anthony Rubio Designs New York Fashion Week runway show for pets and women. 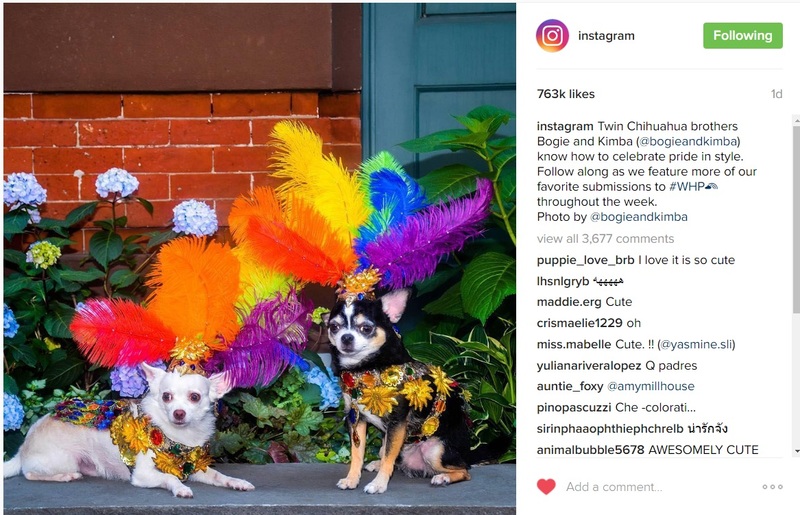 What inspired him, how he created these extravagant outfits, what was it like working with social media dog stars. OnlyPOSH.com’s feature on Anthony Rubio Designs Fall/Winter Collection at New York Fashion Week with all new photos by Arman Hossain. Now I’ve made the press in yet another part of the world. 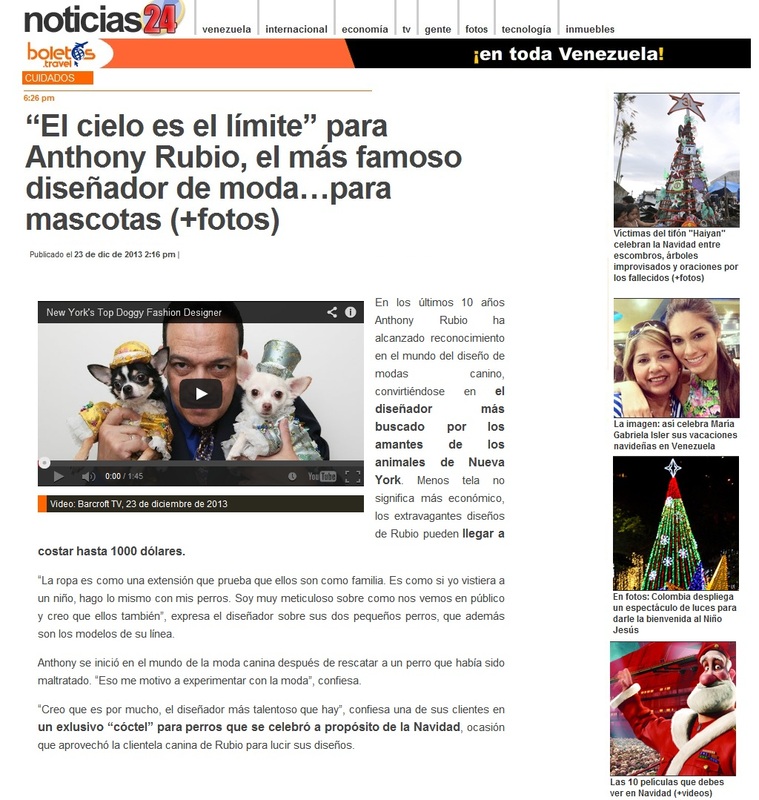 Here is my interview as it has appeared in the press in Venezuela on Noticias 24. Now I find that I am monitoring how my brand & I are circulating the world. Anthony Rubio Interview in India on NP Sanjal. My designs being viewed and celebrated all over the world. I sure hope so. 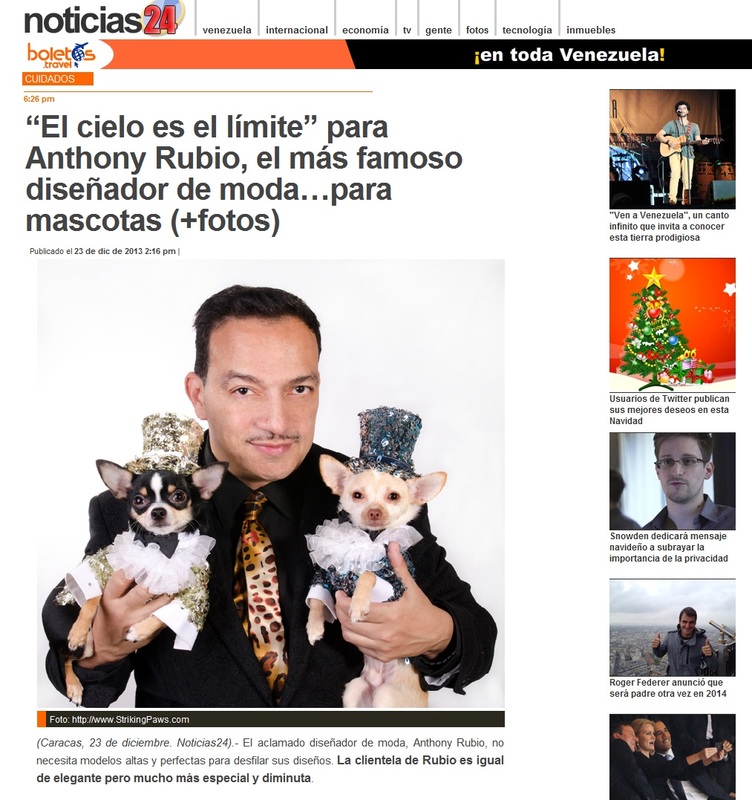 Here is my latest article for TheLatino Show Magazine(print edition) on fashion for dogs. Ten, fifteen years ago you would get the stink eye if you walked your dog with clothing on, now its expected. The outfits in the pictures are mostly editorial looks, but a great looking coat or sweater will go a long way. Can you imagine life without clothing for your four-legged family member? I’m from a luxury company and i would like to have an email contact for an enterview for our exclusive luxury magazine. My email contact is:saramoreira@lustte.com. Best Regards.